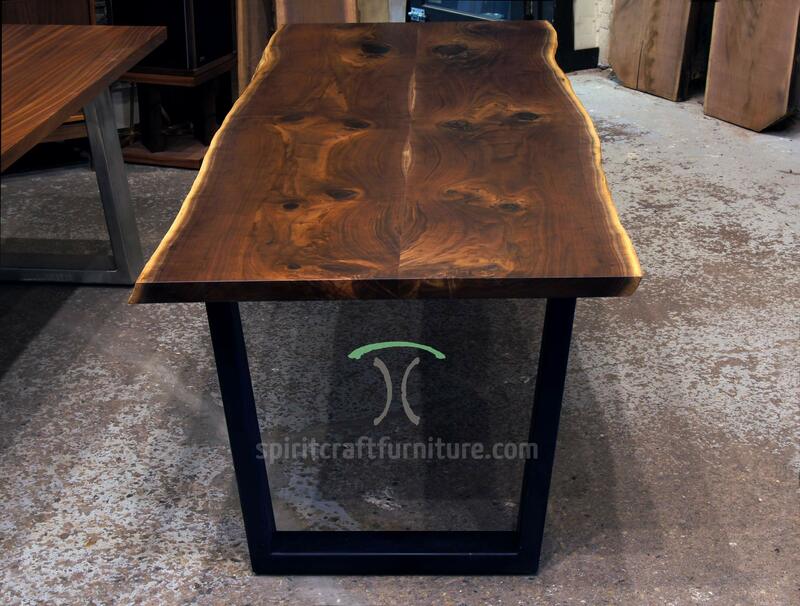 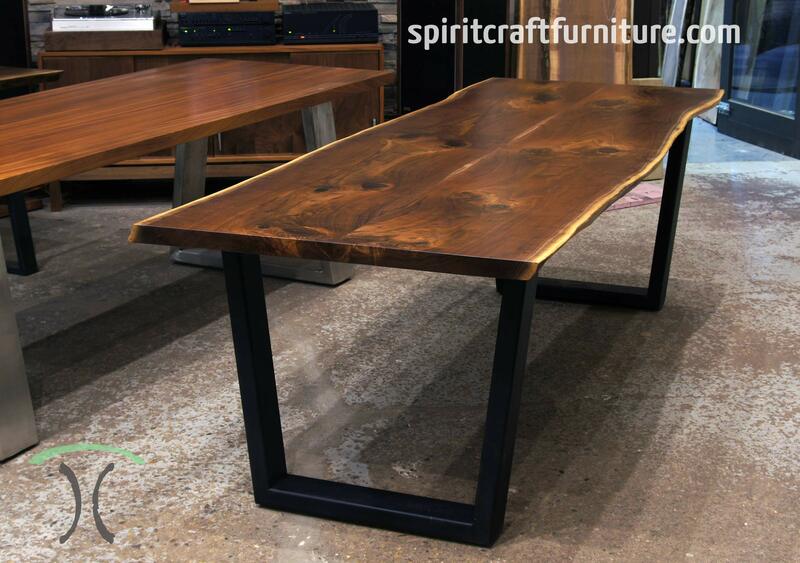 We specialize in live edge and solid wood slab dining, console & conference room tables and counter, desk and kitchen island tops that are handcrafted in our Chicago area custom table furniture shop in Dundee, Illinois. 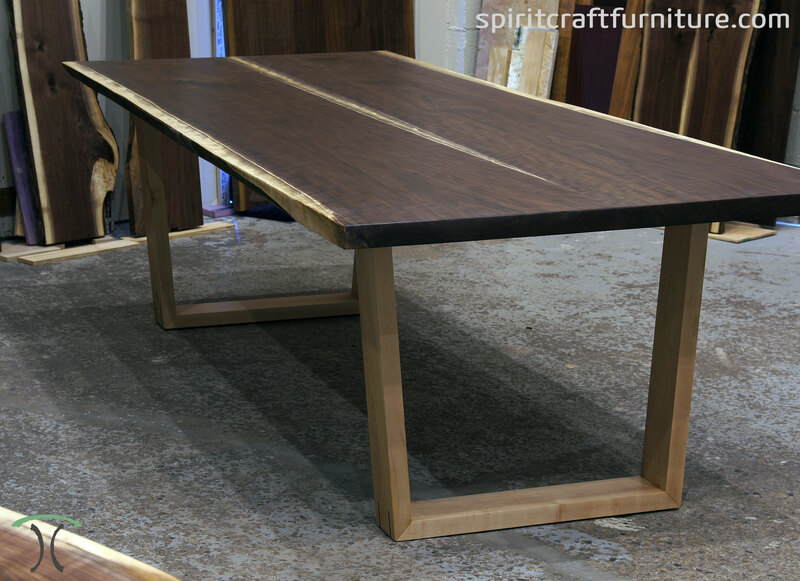 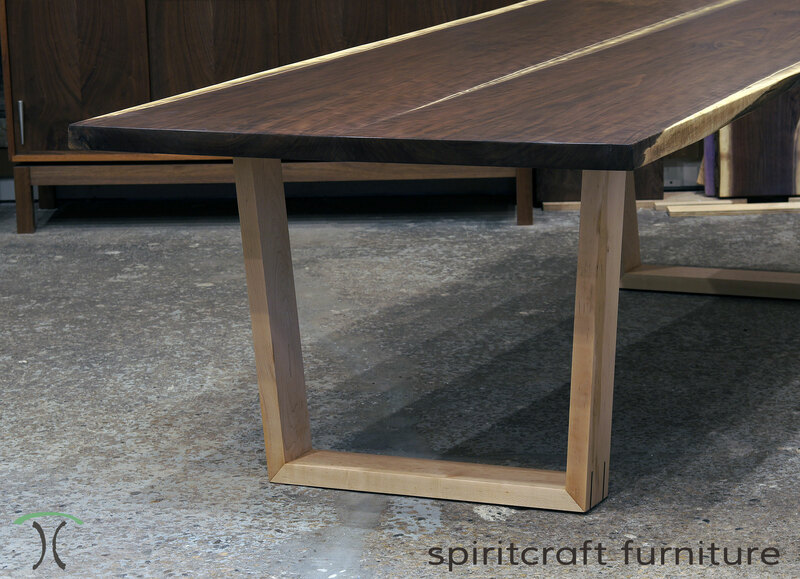 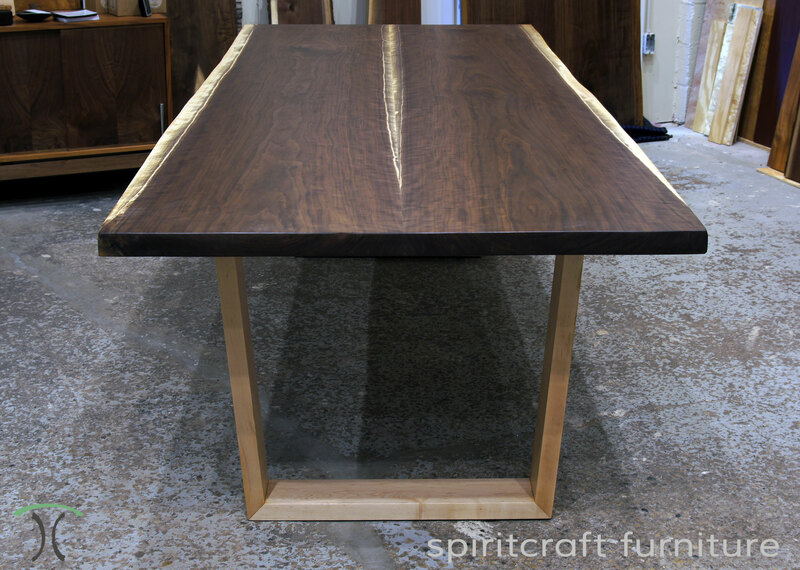 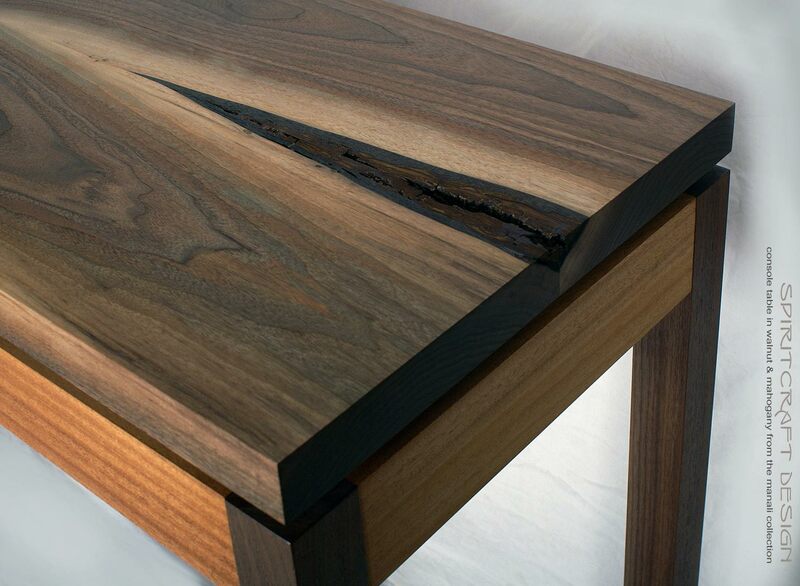 As furniture makers, our custom made slab table tops and tables are handcrafted to endure generations as we understand wood movement, craft perfect glue joints and treat every slab table as if it is artwork going on public display. 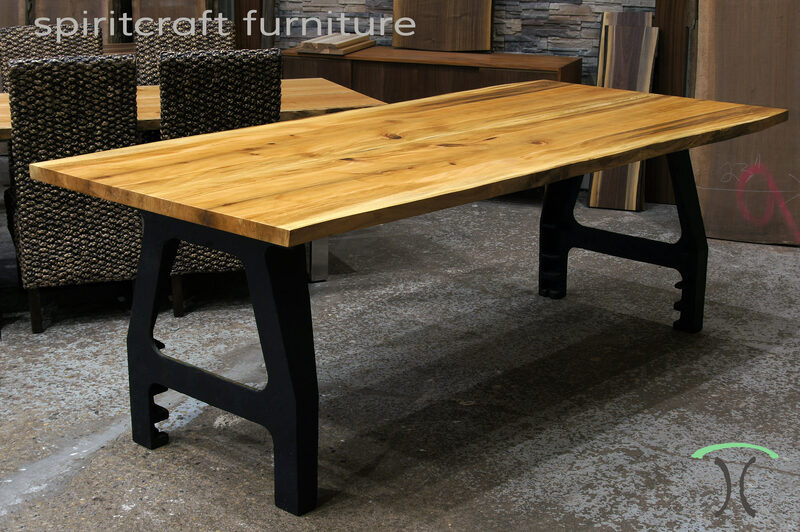 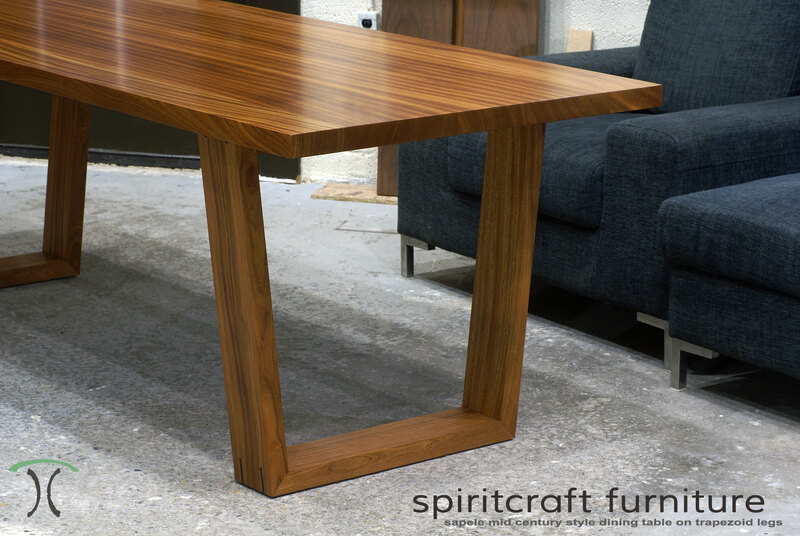 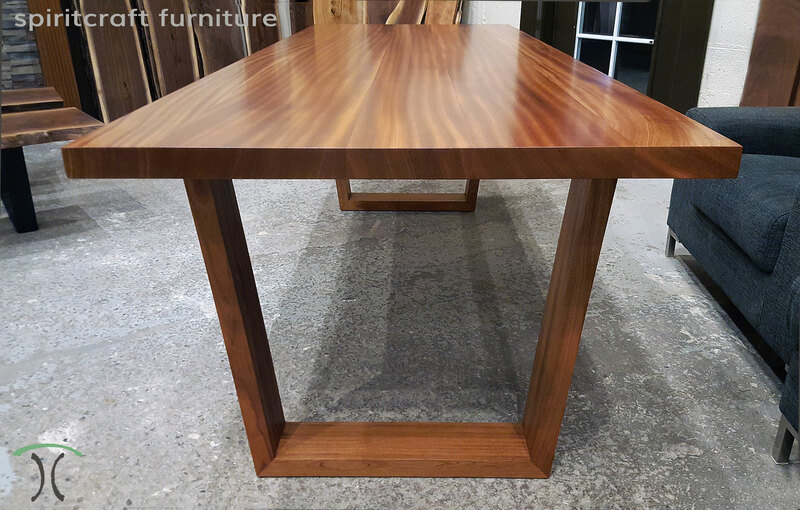 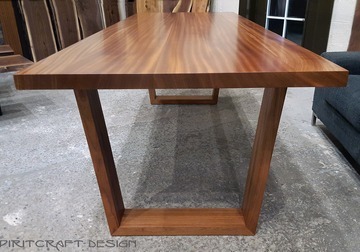 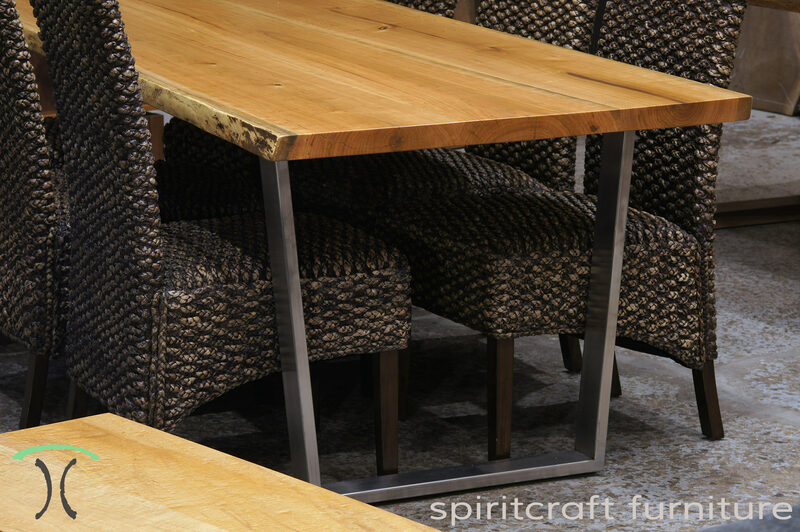 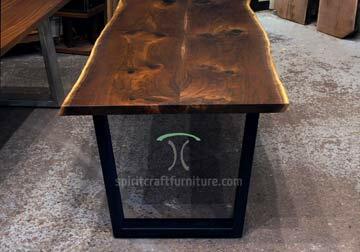 Our custom made tables are available with natural edges or with thick hardwood slab tops cut in more sleek rectangular, square and oval shapes. 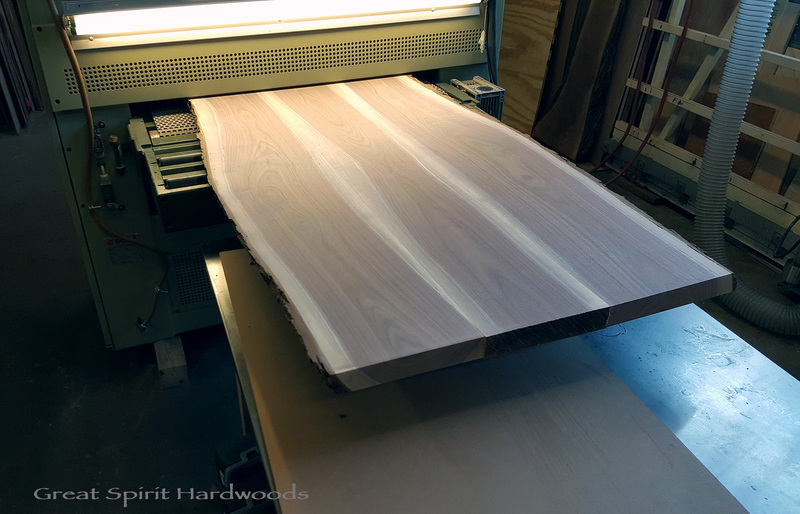 Our hardwood lumber is of the highest quality and our domestic hardwood slabs are taken from large rescued storm downed trees and then carefully kiln dried. 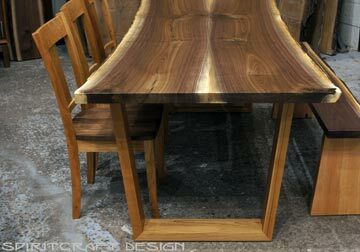 Visit our Chicago area live edge furniture gallery in East Dundee, IL. 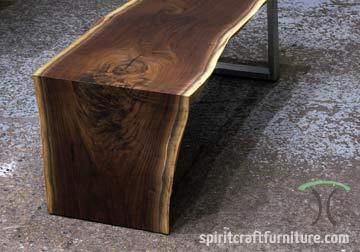 Our live edge and slab tables in Black Walnut, Cherry, Ash and other species: We offer solid hardwood live edge slabs in many domestic species including Walnut, Cherry, Ash, Maple, Sycamore, Elm, Honey Locust and more. 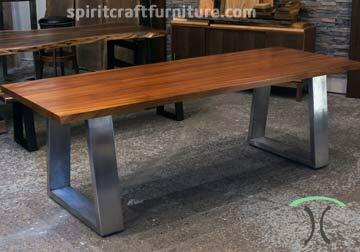 Our slab tables are available in any non threatened hardwood and we specialize in stunning top in Sapele, a dense and beautiful cousin of Mahogany. 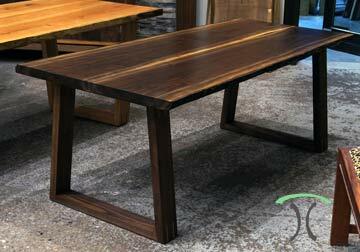 Our live edge tables and tops are at home in nearly any decor style while our rectangular slab table designs will enhance Mid Century Modern, contemporary and eclectic design motifs. 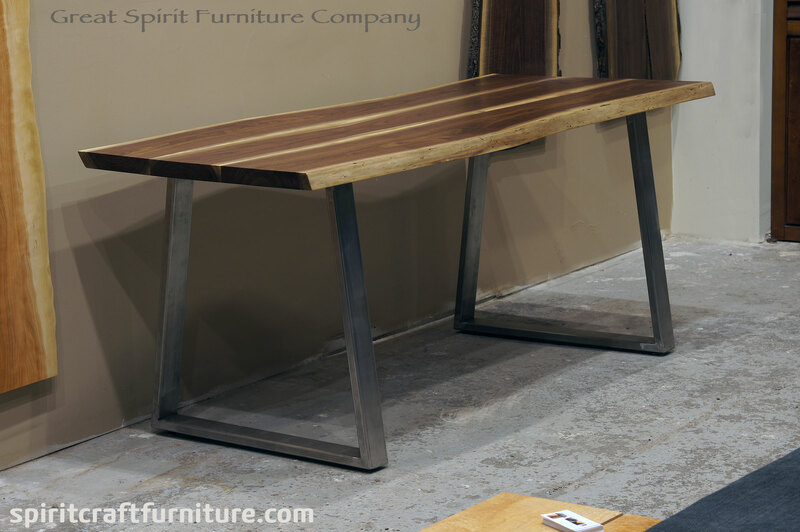 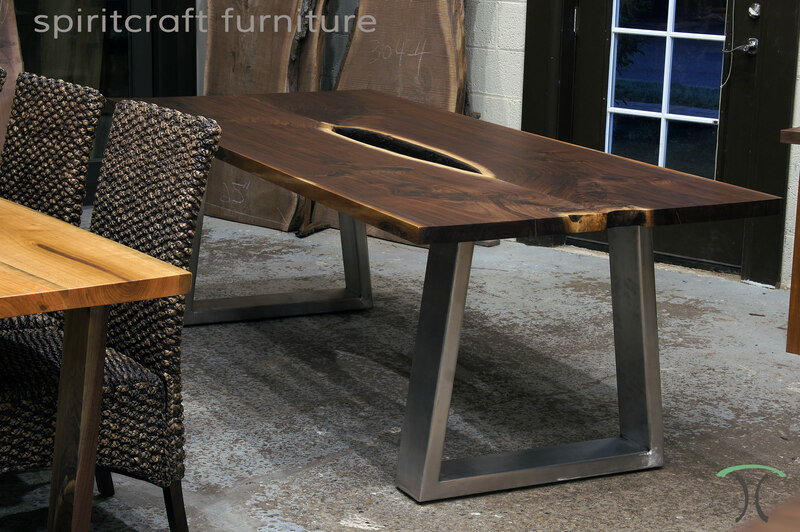 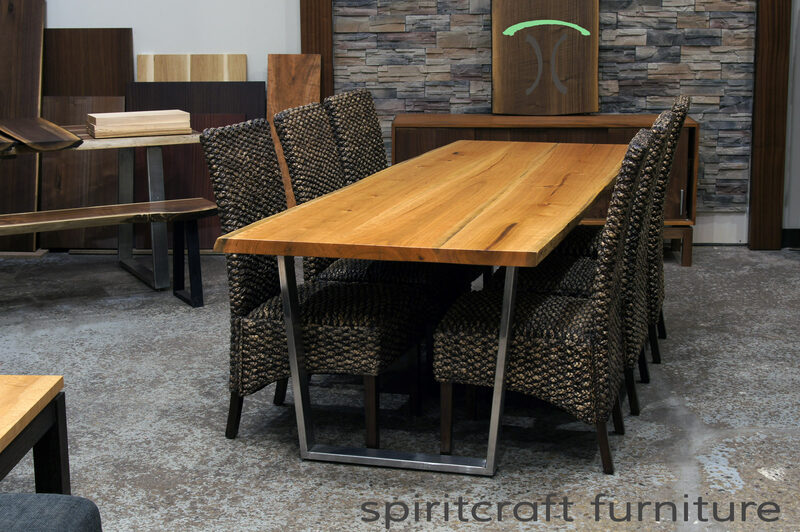 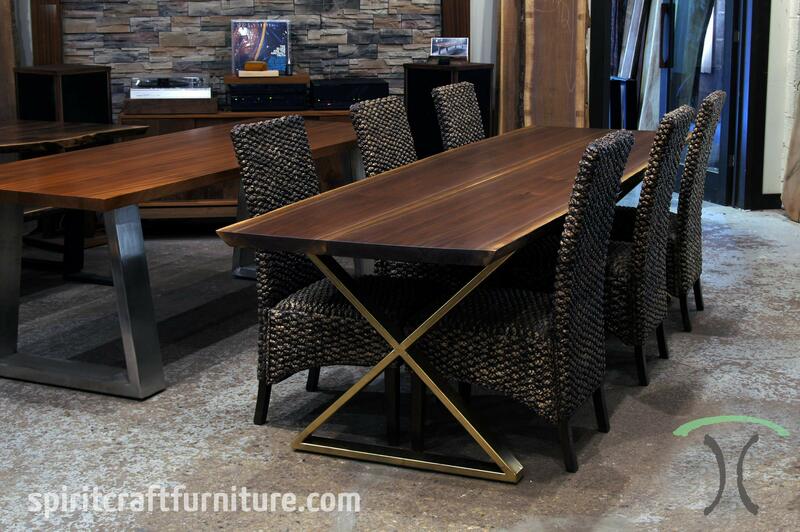 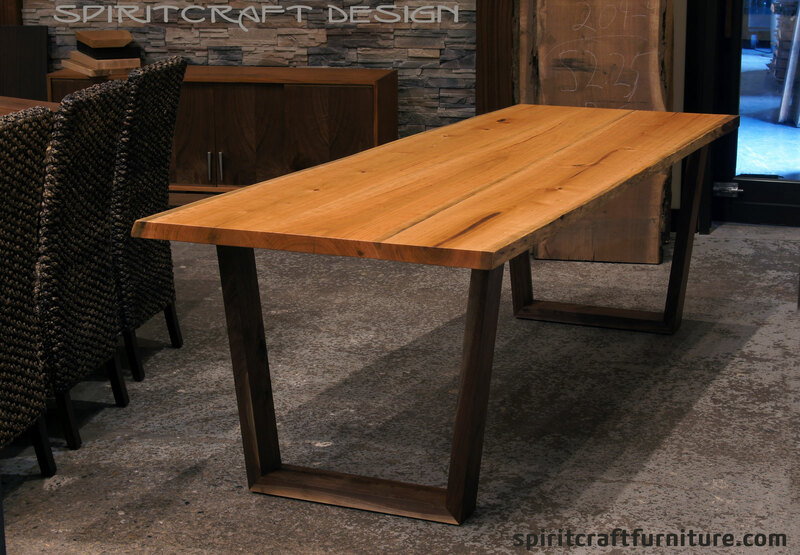 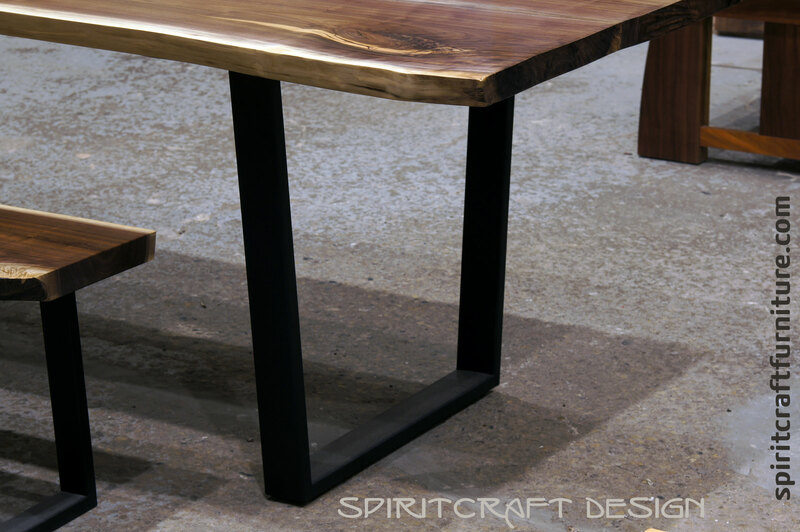 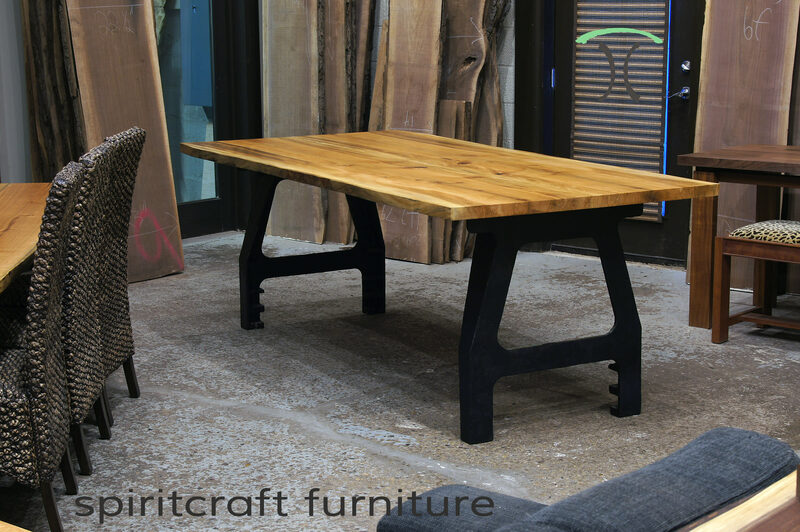 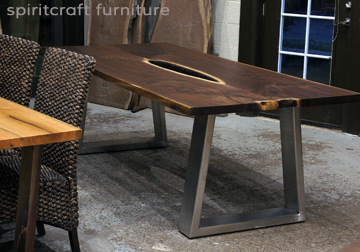 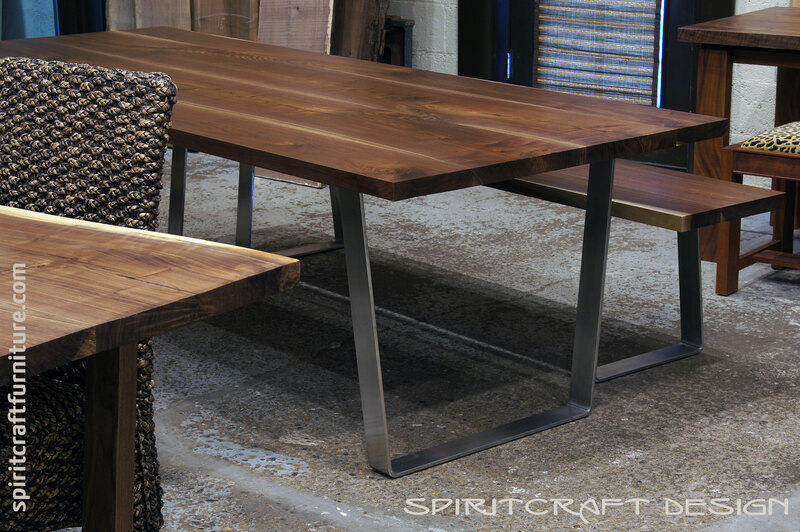 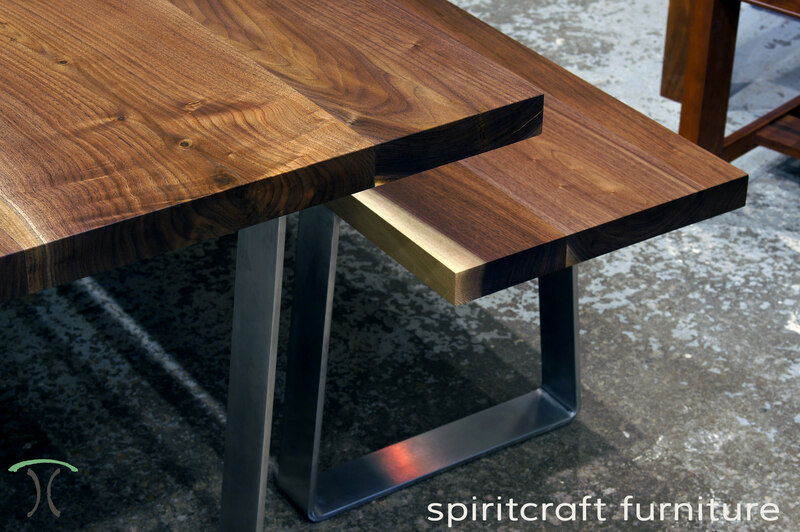 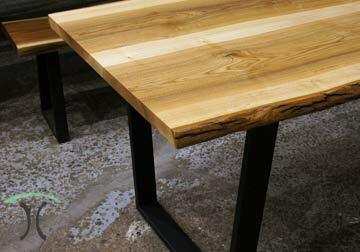 Our slab and live edge tables are available with heirloom quality solid hardwood legs in our Mid Century Modern influenced designs or with coated steel and stainless legs in a variety of styles for a more transitional, urban, cottage or industrial look. 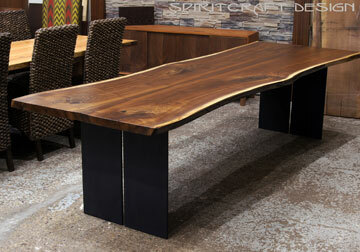 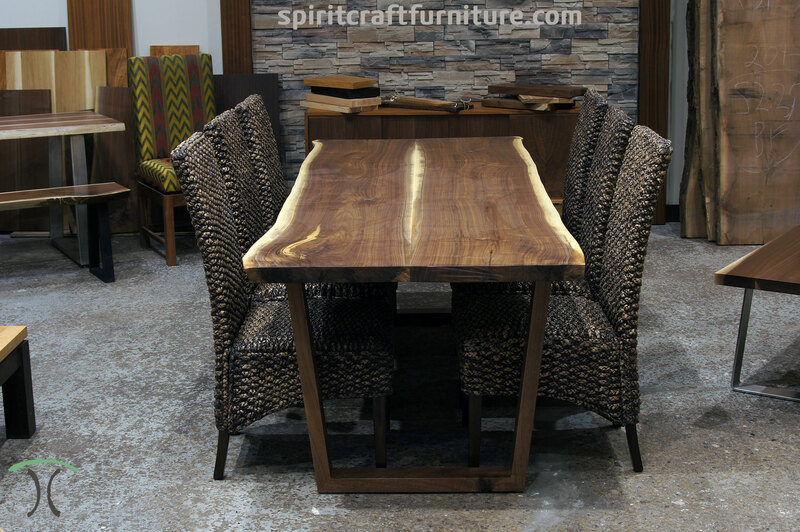 Spalted Sycamore Live Edge Slab Dining Table at our Chicago Area Living Edge Furniture Store in East Dundee, IL. 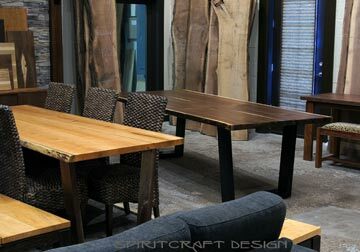 Our clientele includes residential clients, wineries, restaurants, kitchen & restaurant designers and home decor retailers who resell our beautiful kiln dried slab tops and finished tables. 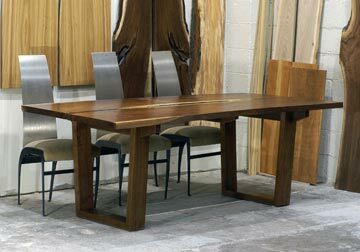 Our tables are available locally to the greater Chicago area at our furniture showroom and furniture making facility in the Chicago suburbs, in beautiful East Dundee, Illinois. 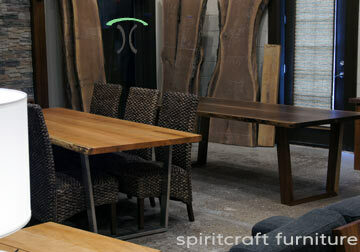 We also ship nationally through trusted white glove delivery partners. 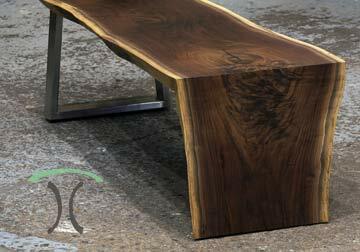 Our lead time varies and depends on factors such as leg design and material, kiln schedules and of course work flow. 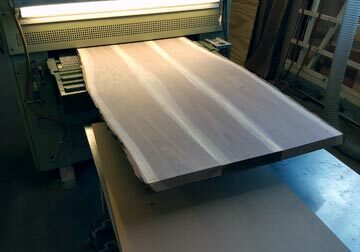 Four to eight weeks is a safe bet depending of course on if the slabs selected for a table are still in the air drying phase and not yet in our kiln. 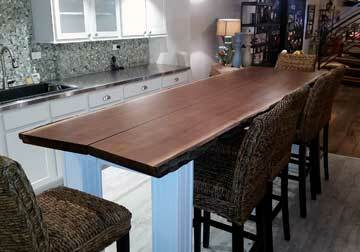 We also have completed tables and tops on our floor in various sizes, hardwoods and designs. 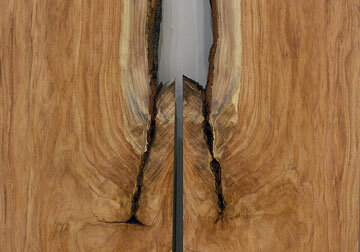 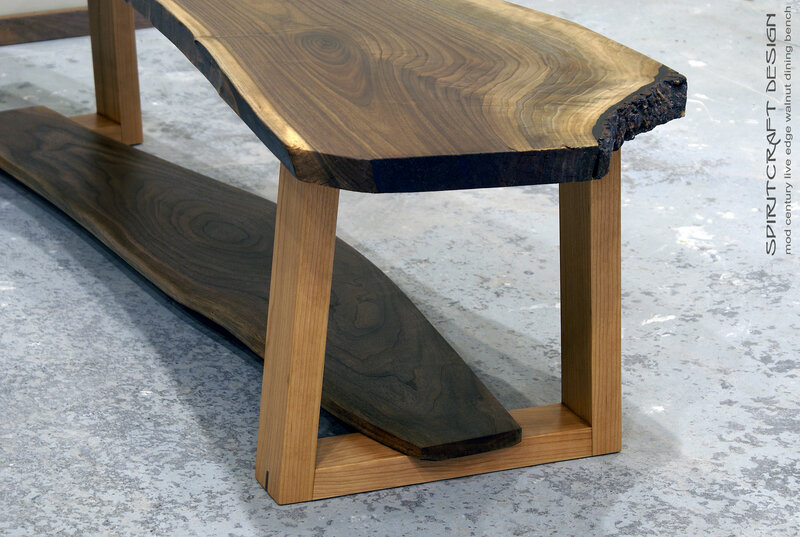 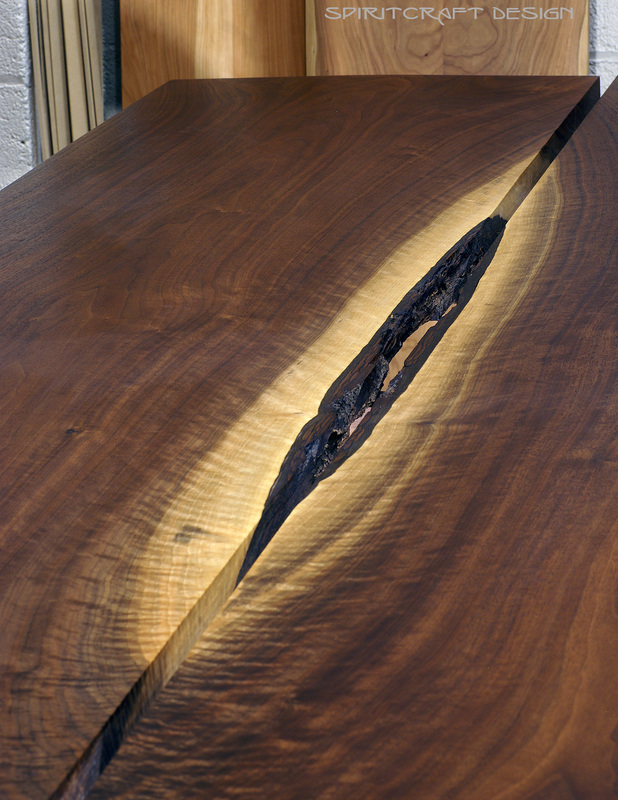 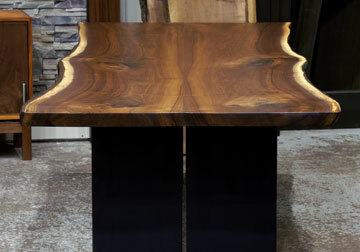 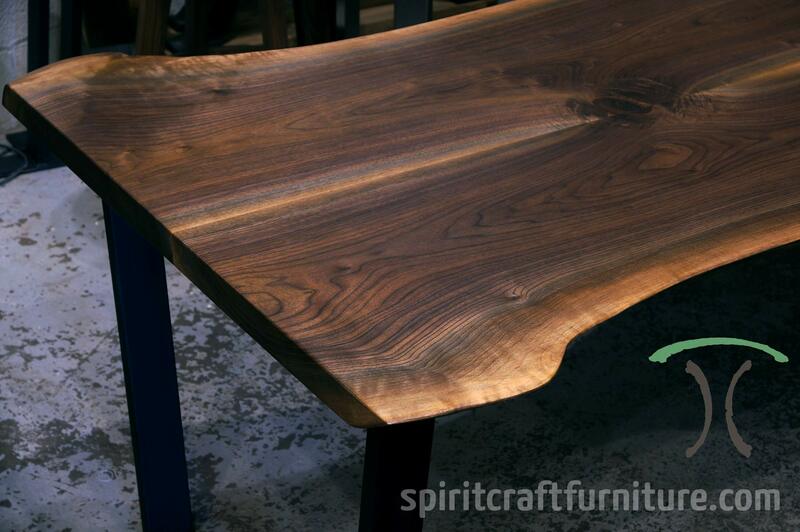 Visit our live edge table gallery. 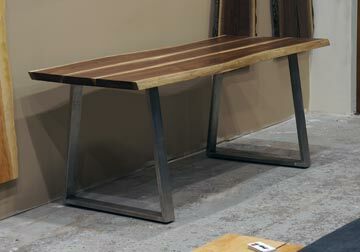 Finished Slabs for Benches, Shelving, Wall Displays etc. 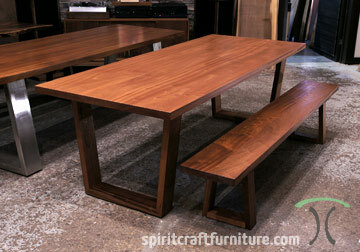 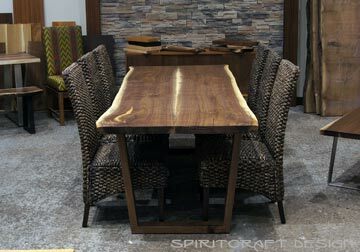 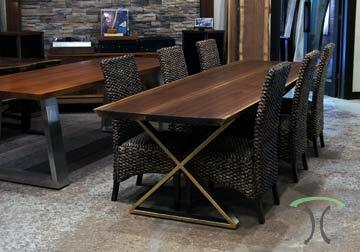 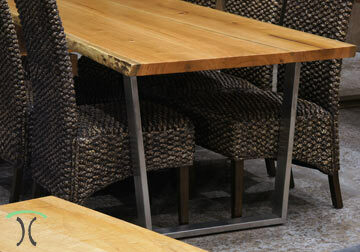 Tables Priced by Length, Width, Hardwood and Leg Selection, Inquire. 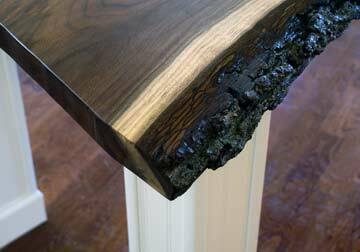 We offer a variety of leg options for our live edge and slab tables and table tops with options that will enhance any decor style. 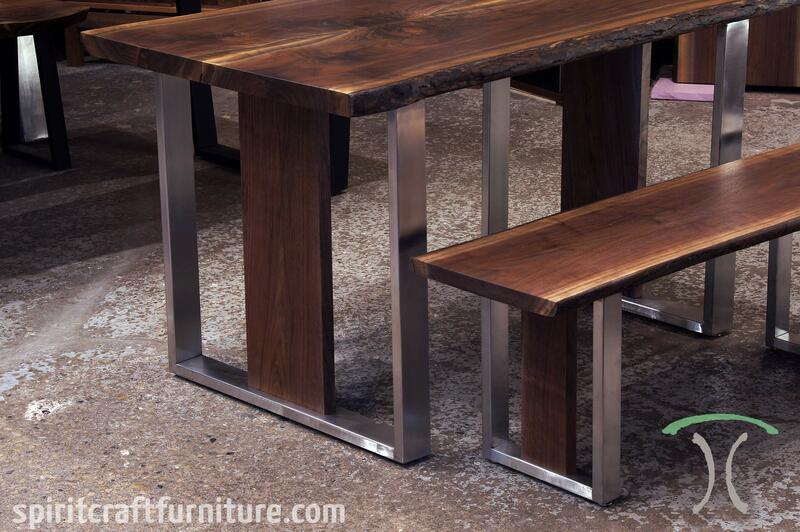 We offer a variety of hardwood and metal legs in designs that will compliment any decor style. 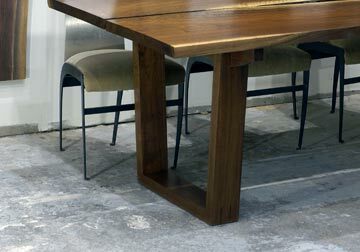 Our mitered floating slab design and trapezoidal legs are influenced by Modern Architecture and by Mid Century furniture designers. 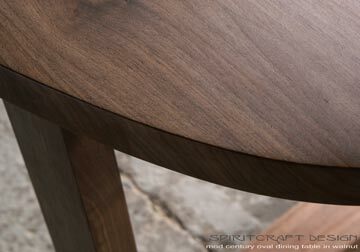 Both feature expertly crafted miter joints that are splined for eye appeal and for generational endurance. 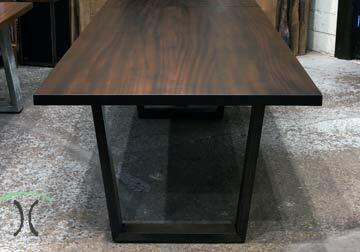 We also offer a wide range of metal legs in various styles in painted black and powder coated steel as well as in Stainless Steel. 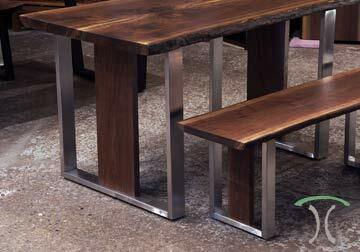 Our metal leg designs have been thoughtfully designed to be better than what is generally available with stout top bars, attachment points that allow for wood movement and with the addition of levelers on all welded legs. 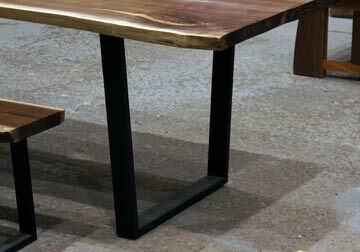 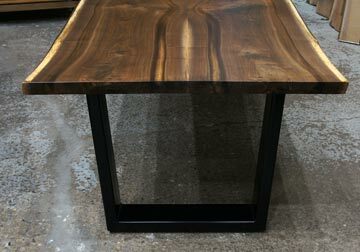 We feel that our live edge tables are showpieces and deserve the best quality and visual appeal in terms of their legs. 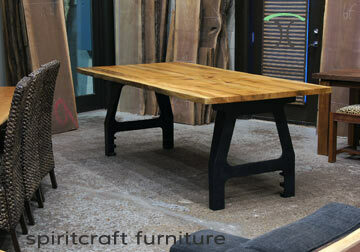 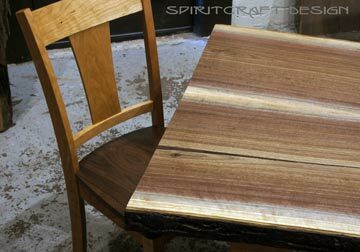 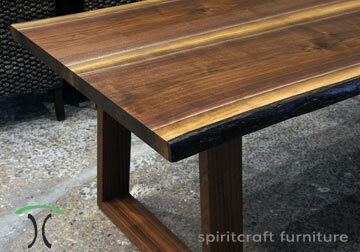 We do also make table tops for those who have their own repurposed base or legs obtained elsewhere. 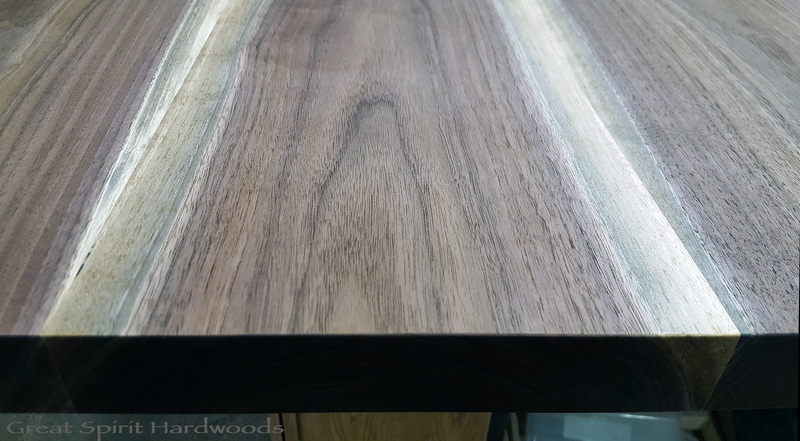 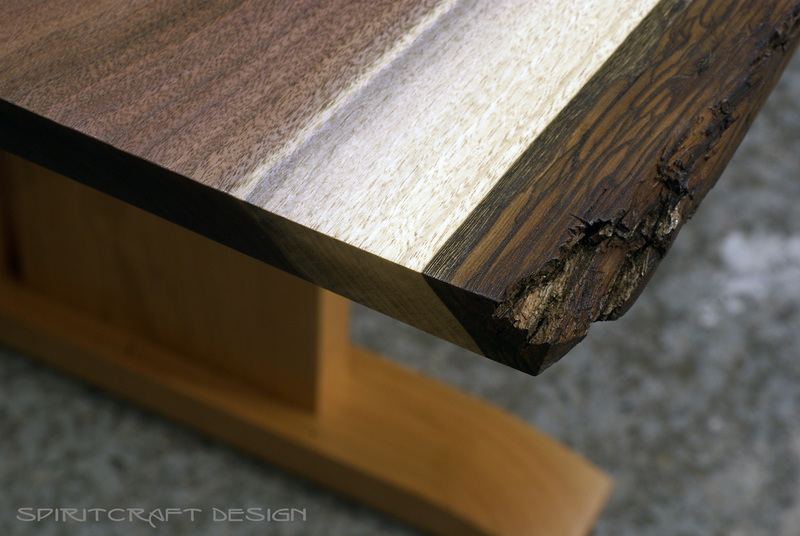 A word about the rescued Black Walnut we use in our live edge tables, and slab table, island and custom solid wood desk tops. 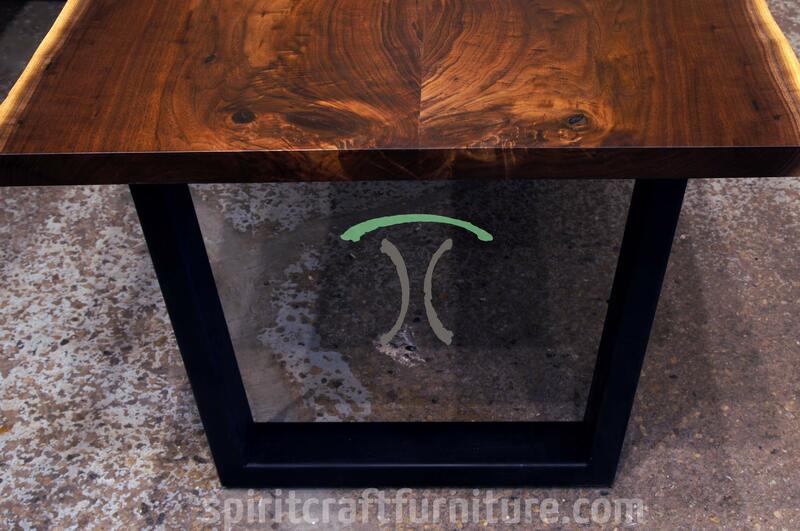 As furniture designers & crafts persons and purveyors of select hardwoods through our wood store, Great Spirit Hardwoods, we have the experience, knowledge and foresight to provide clients with the finest raw slab hardwoods that will become heirloom quality tables and table tops. 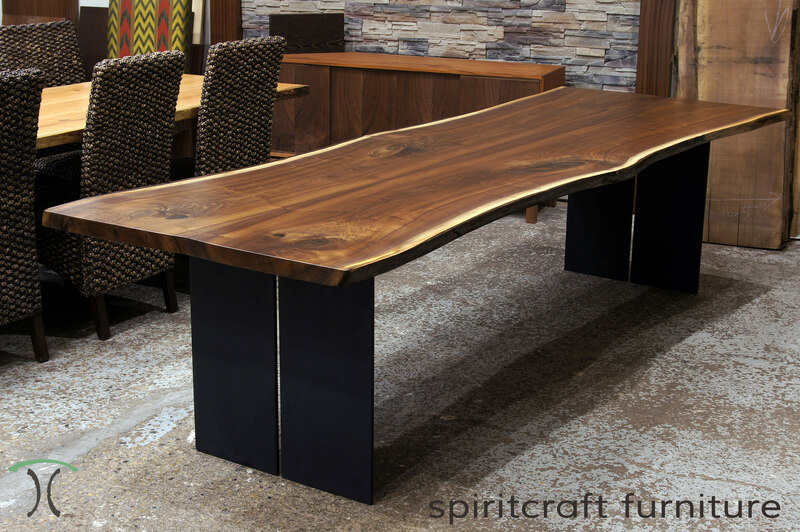 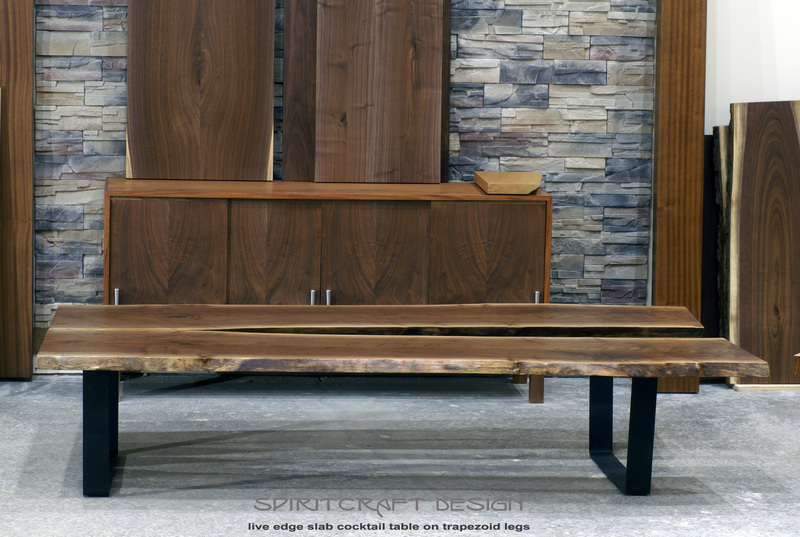 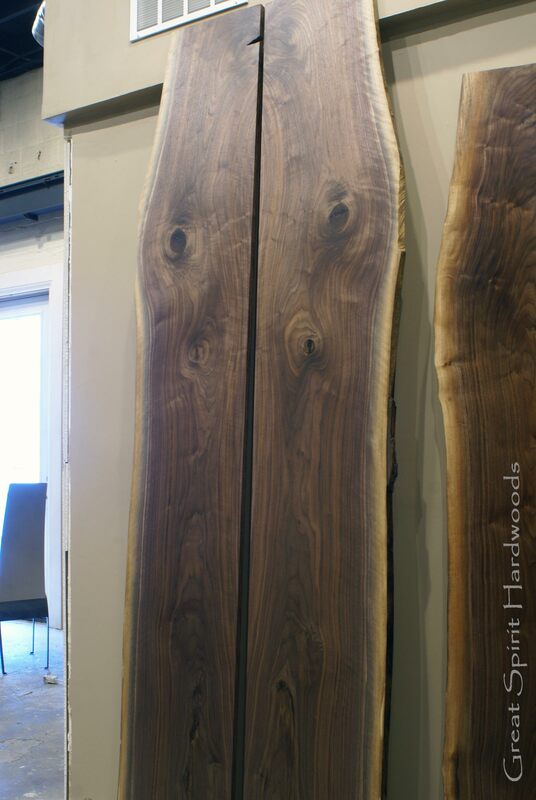 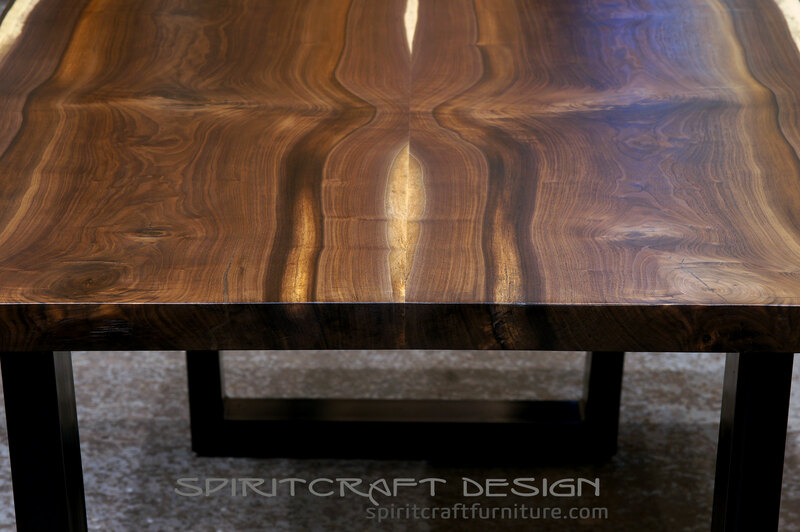 We specialize in Black Walnut slabs and like the raw lumber we offer for sale in our hardwood store and that is used in our fine furniture, this beautiful hardwood is never steamed and thus exhibits the color and palette of hues that the "Great Spirit" intended. 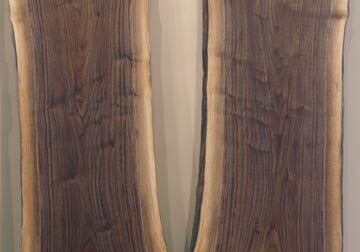 Steaming Walnut is used widely and is a process developed in order to turn the white sapwood of small trees khaki brown but this process also destroys the unique color palette and wonderful beauty of North American Black Walnut. 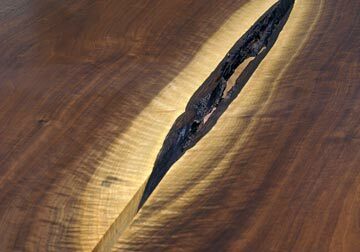 Our live edge slabs are unique and while some still have the bark attached allowing for our sanded bark edge, others exhibit a wonderful natural clean edge of sapwood like that made famous in the work of George Nakashima. 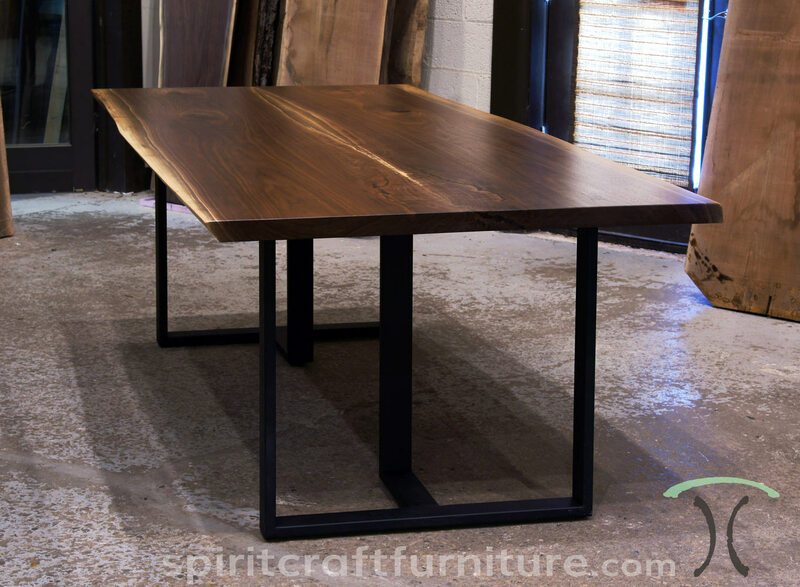 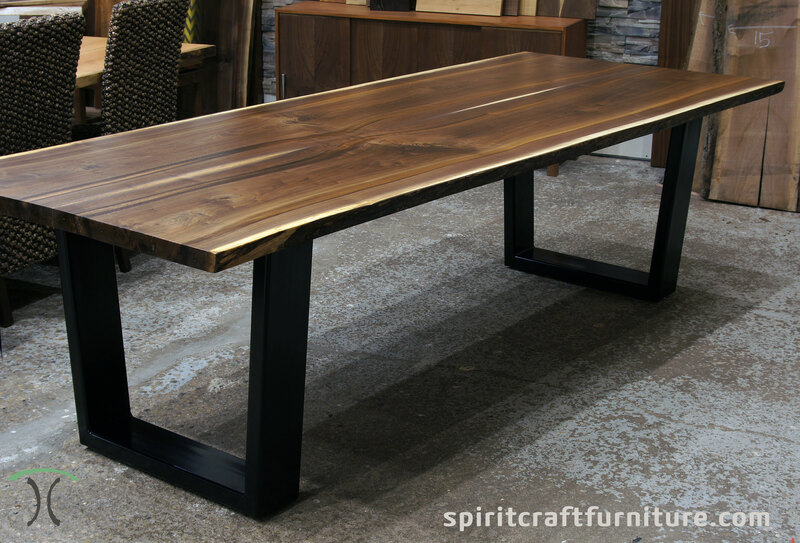 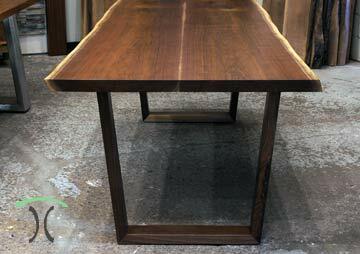 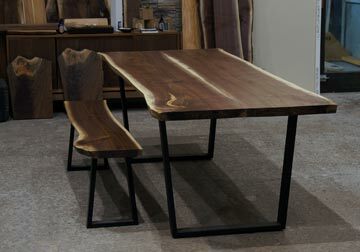 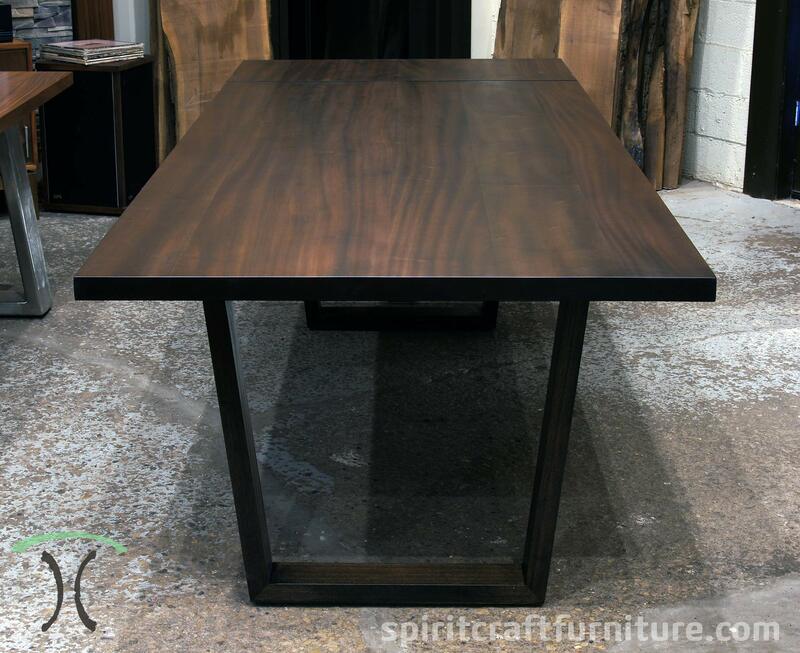 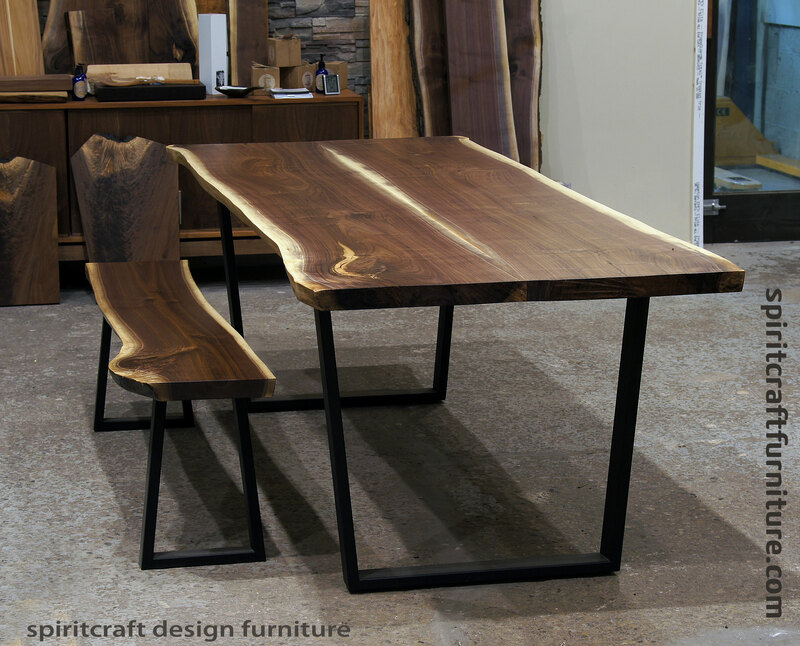 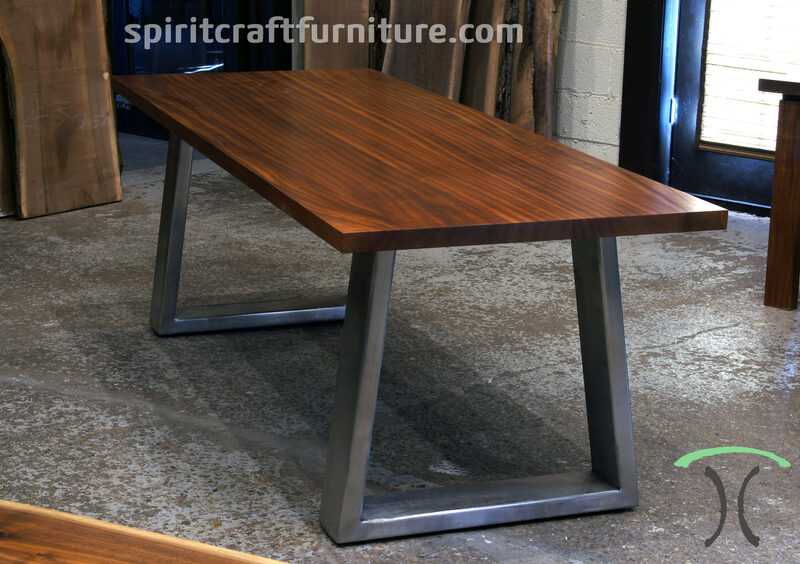 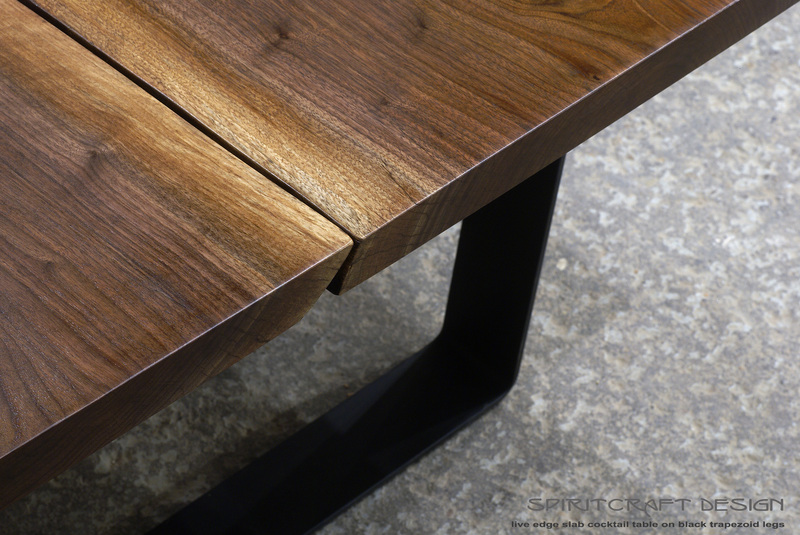 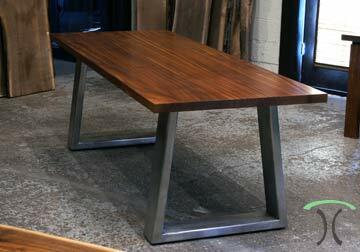 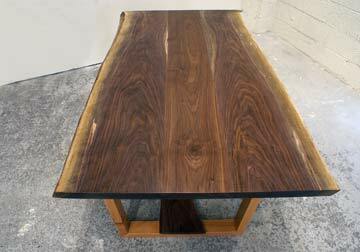 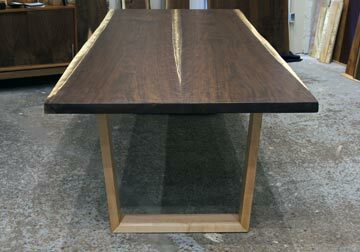 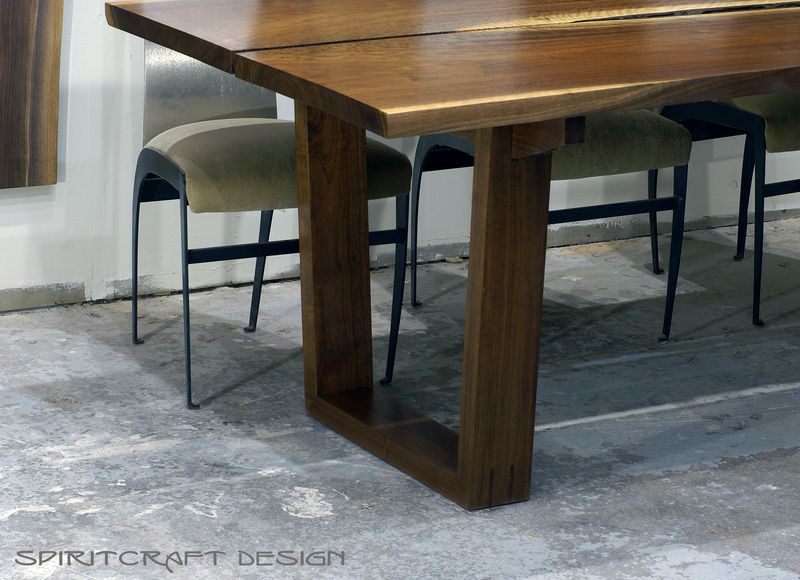 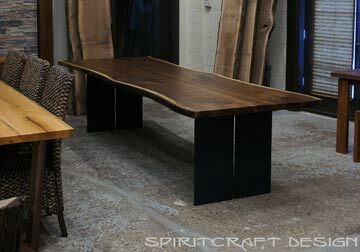 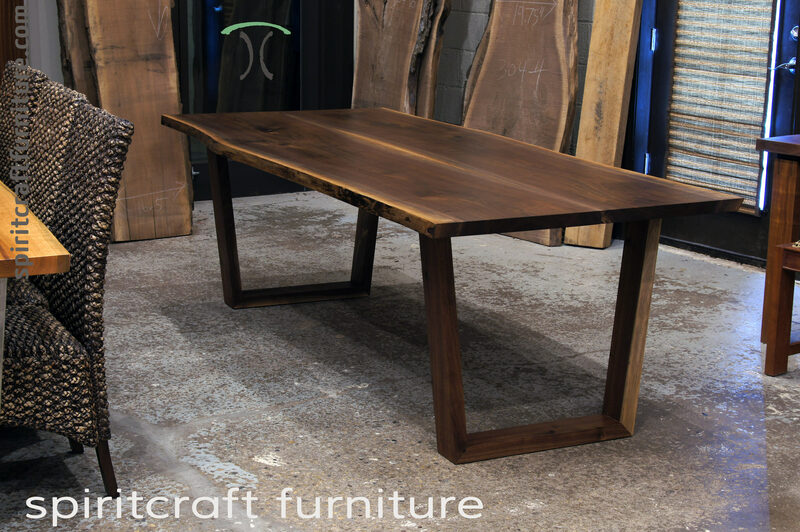 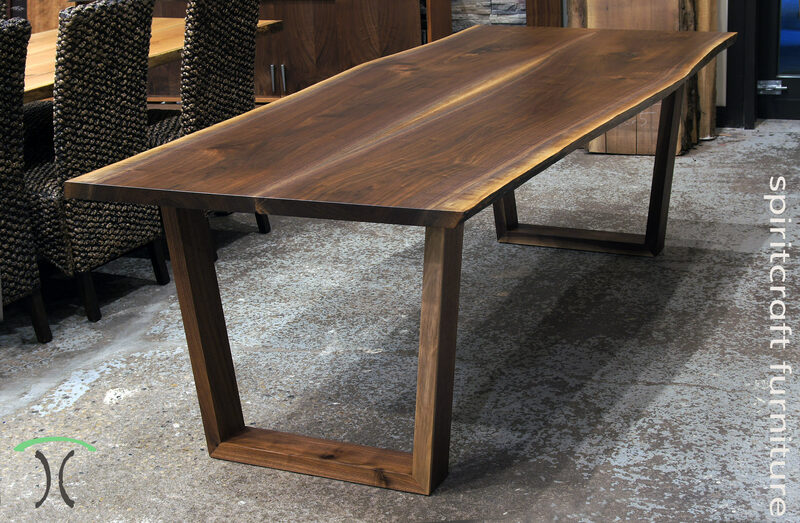 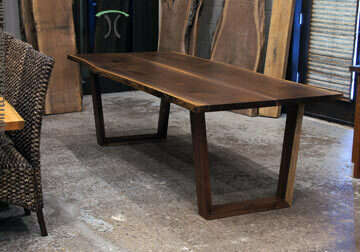 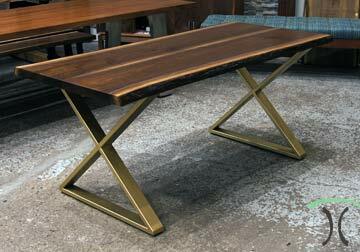 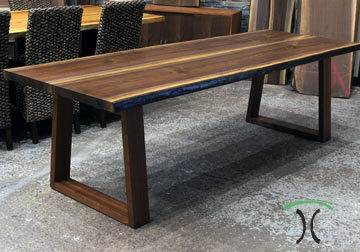 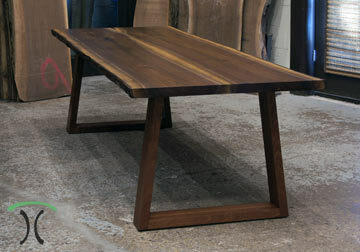 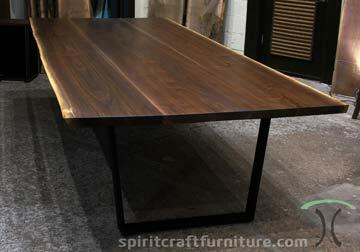 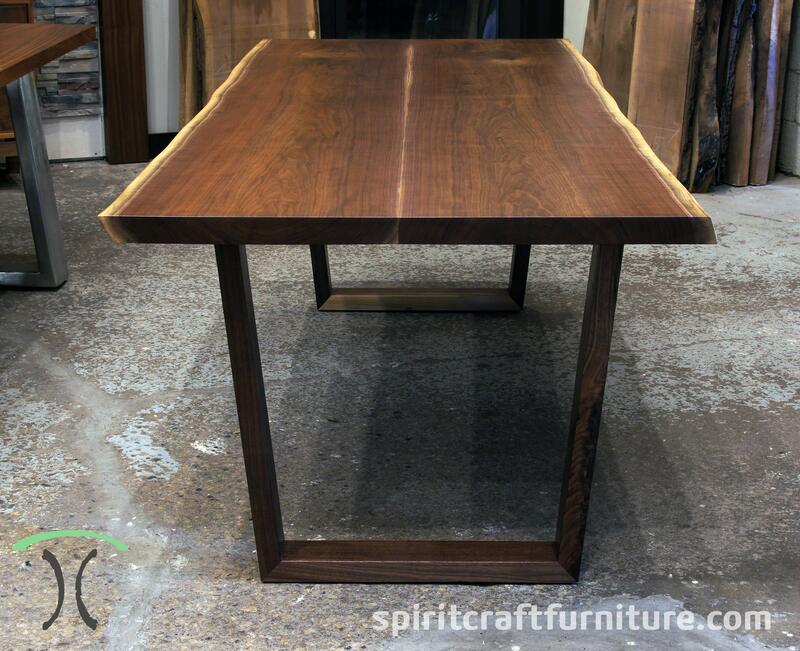 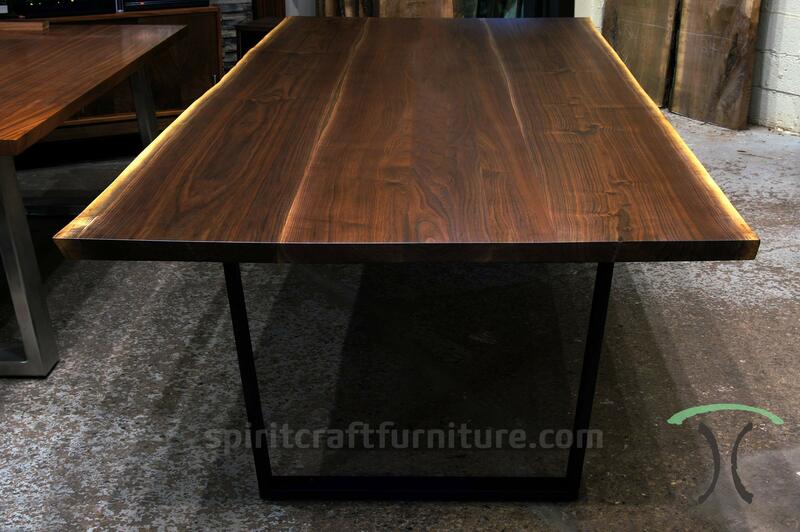 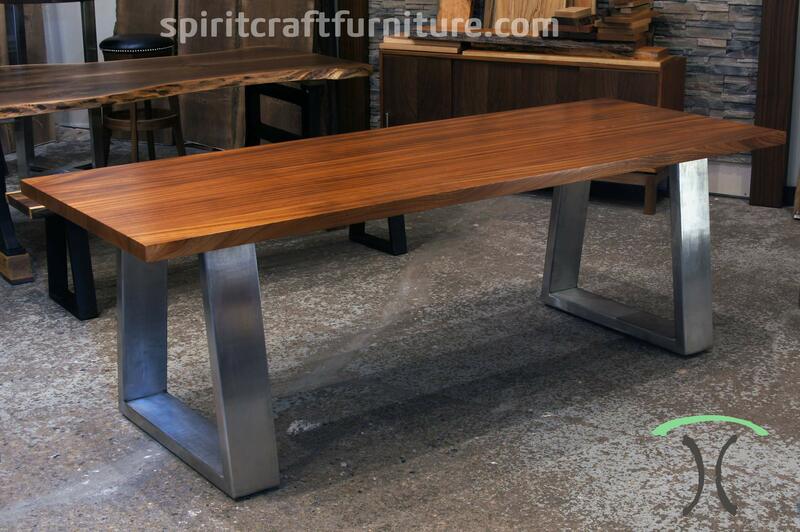 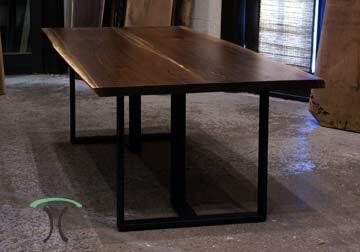 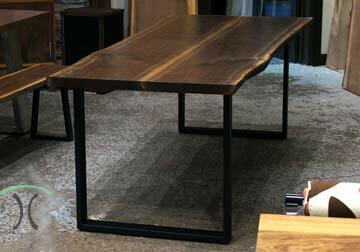 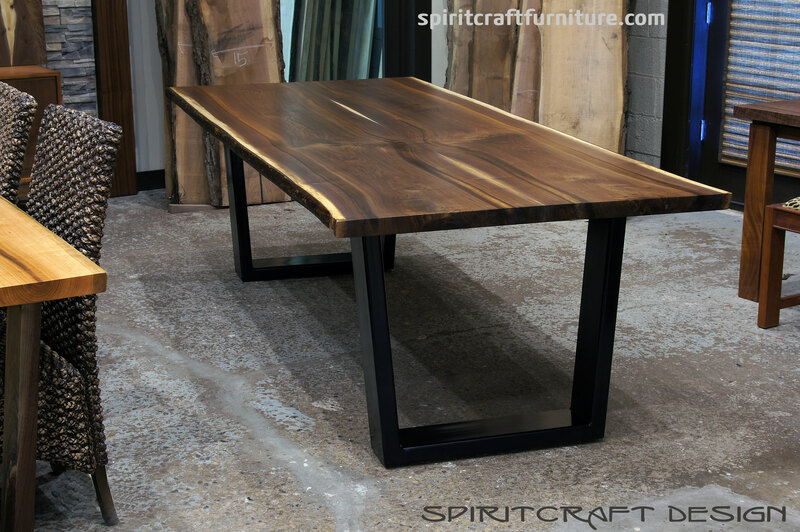 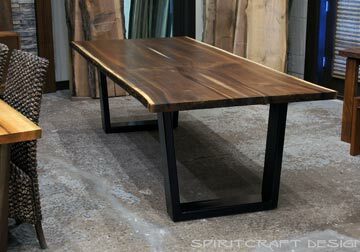 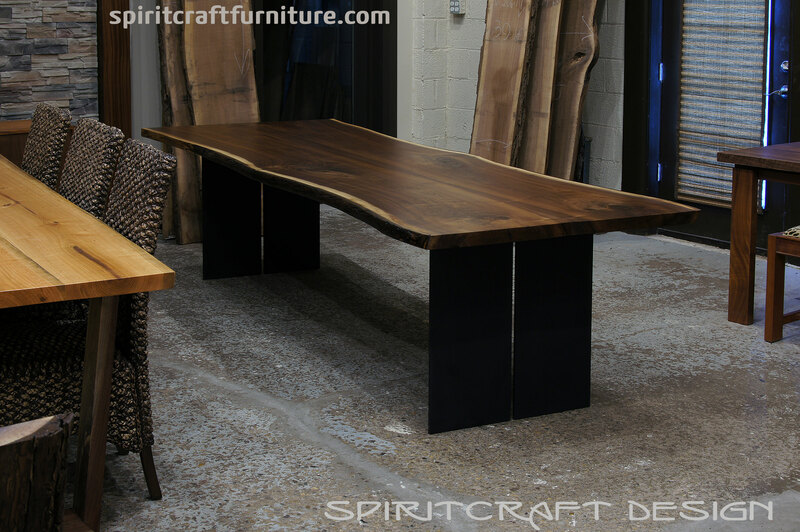 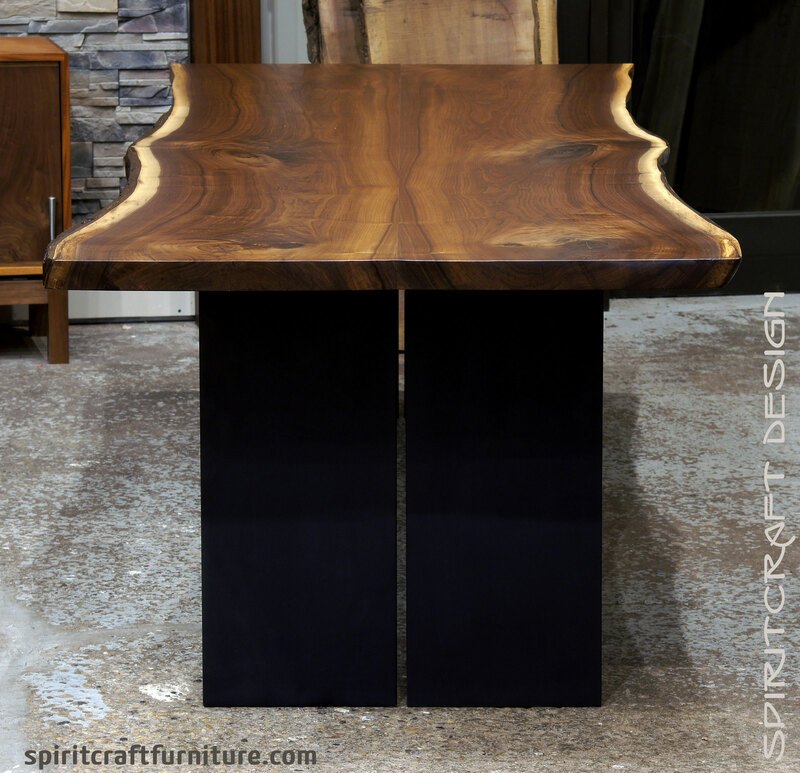 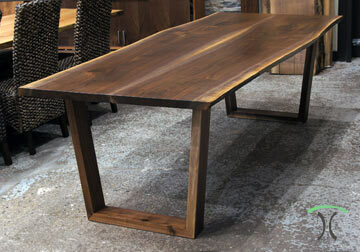 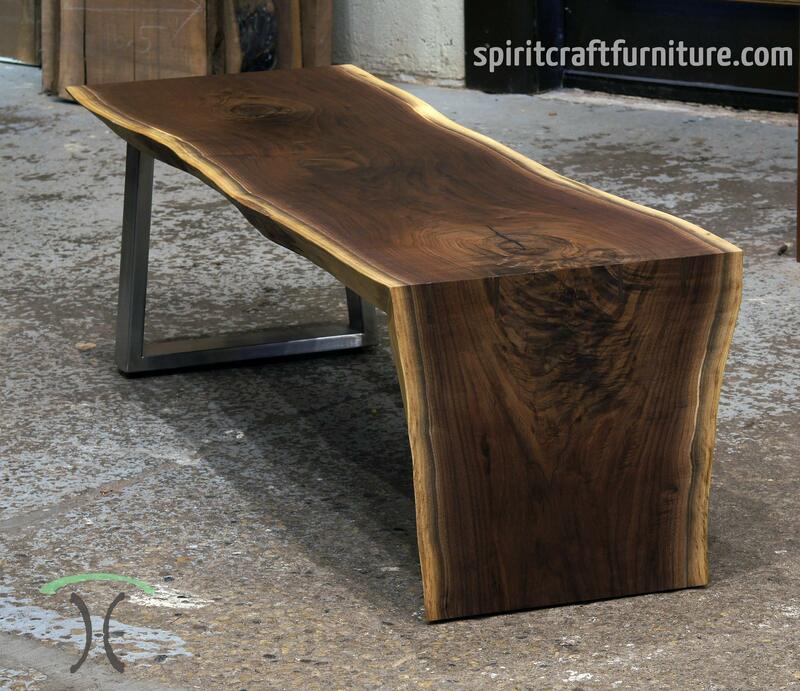 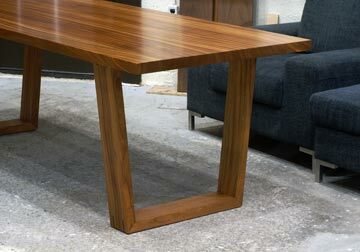 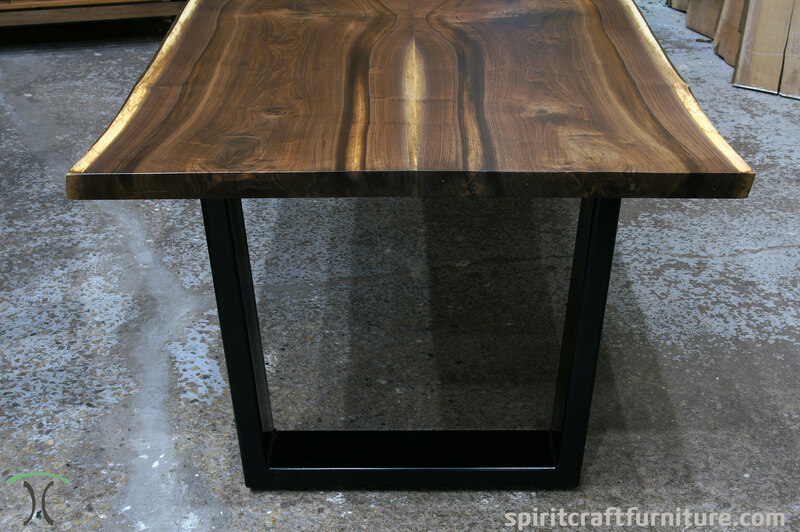 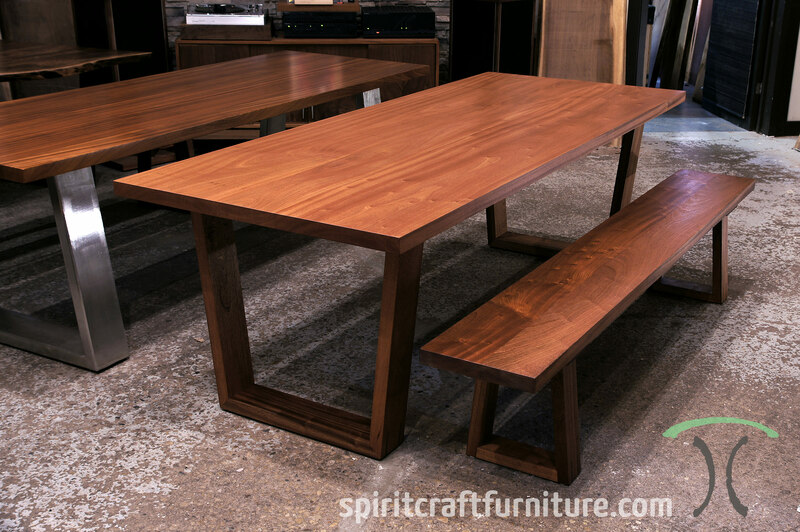 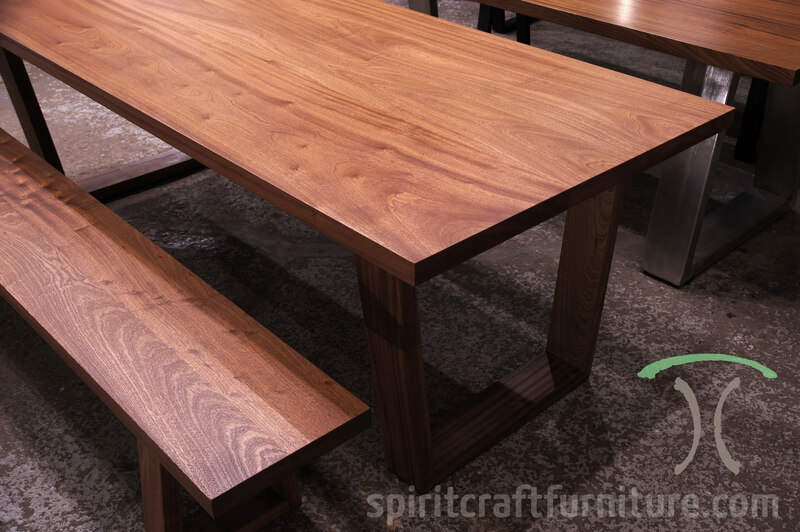 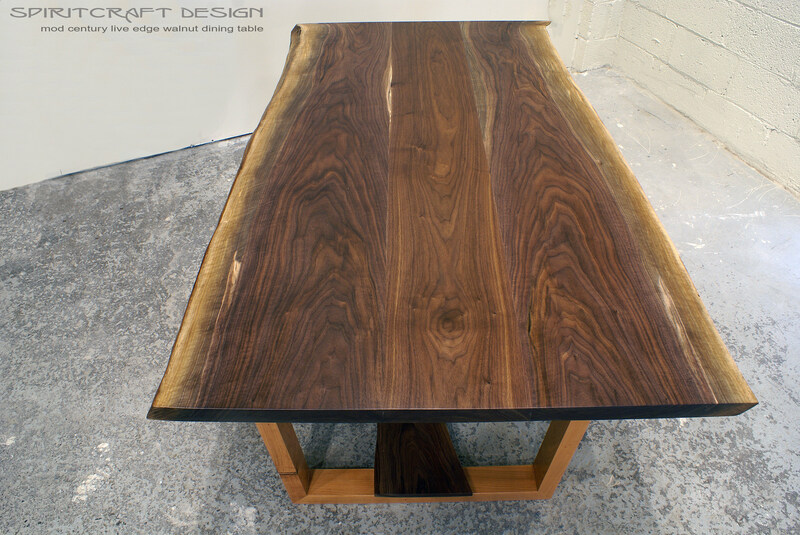 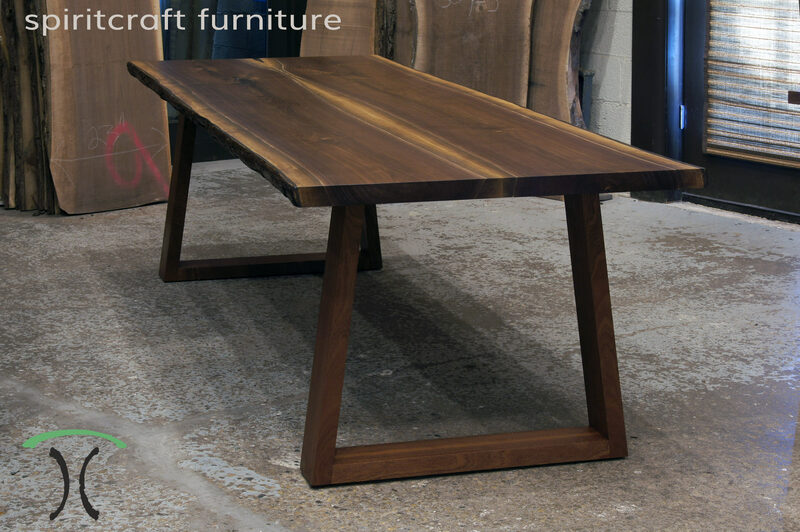 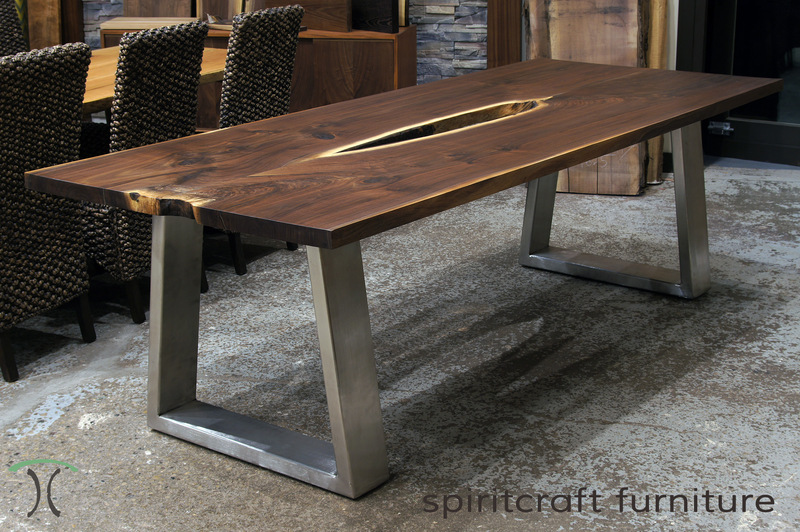 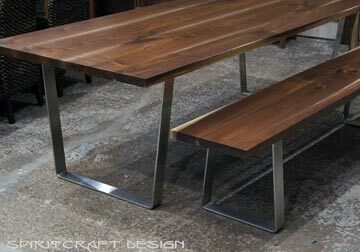 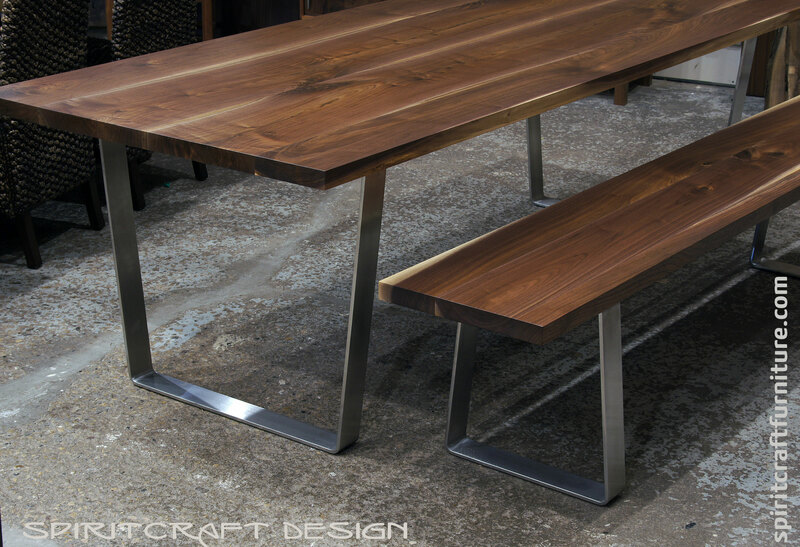 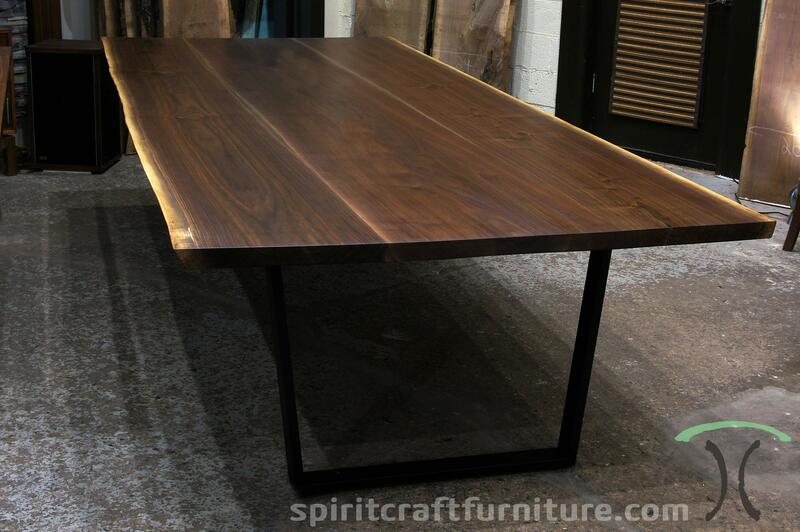 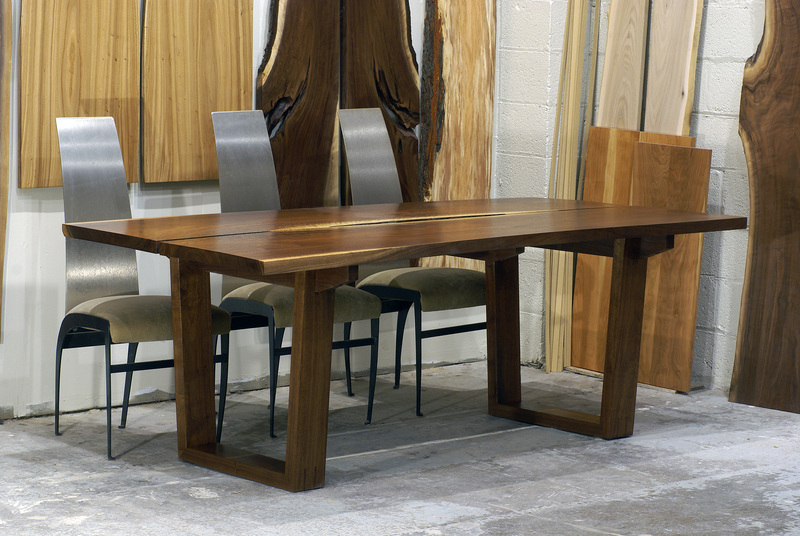 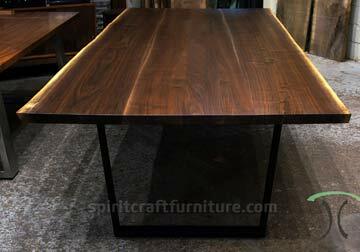 Black Walnut Live Edge Dining Table on X Shaped Welded Steel Legs | 36" x 72" x 1.75"
When considering a slab or live edge top or table, make an informed decision. 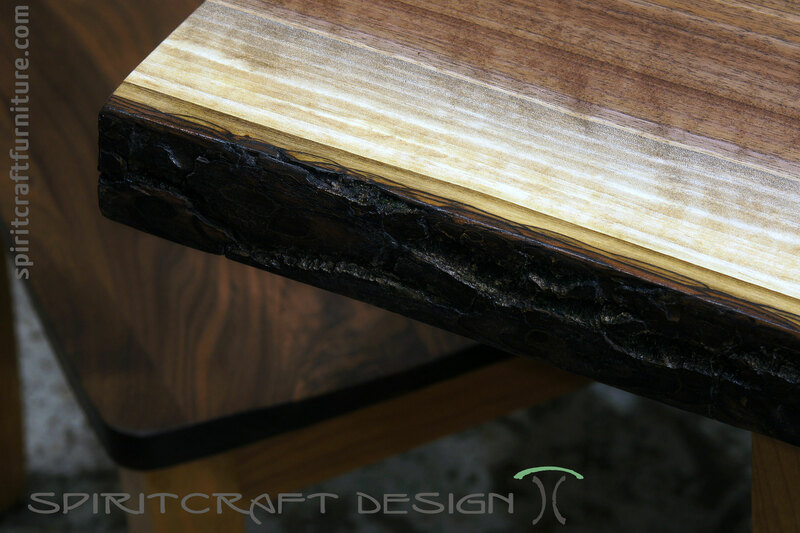 Insist on a craftsperson with experience and use only quality kiln dried hardwood for your table and top or for your stunning live edge slab table centerpiece. 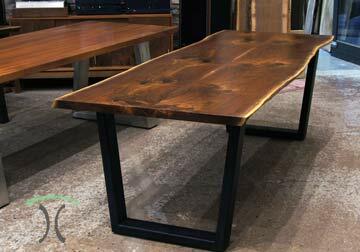 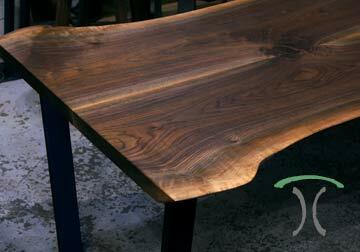 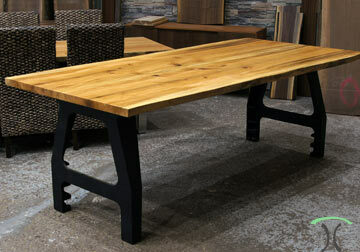 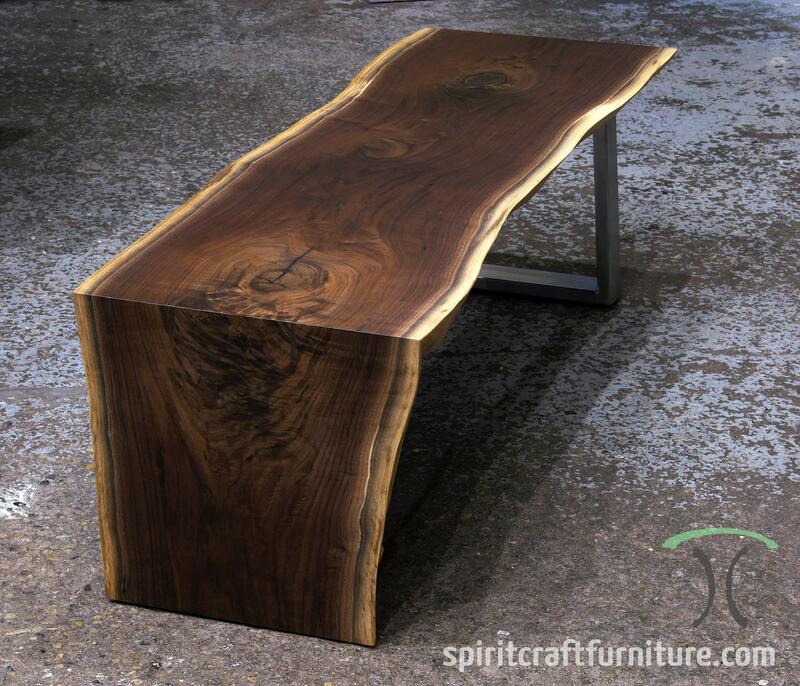 Your investment in a live edge table top or slab table is a significant purchase and should be made with confidence. We offer quality at fair prices and have decades of experience in furniture design, handcrafted furnishing manufacturing and boat-building experience that assures our clients satisfaction in a superior product. 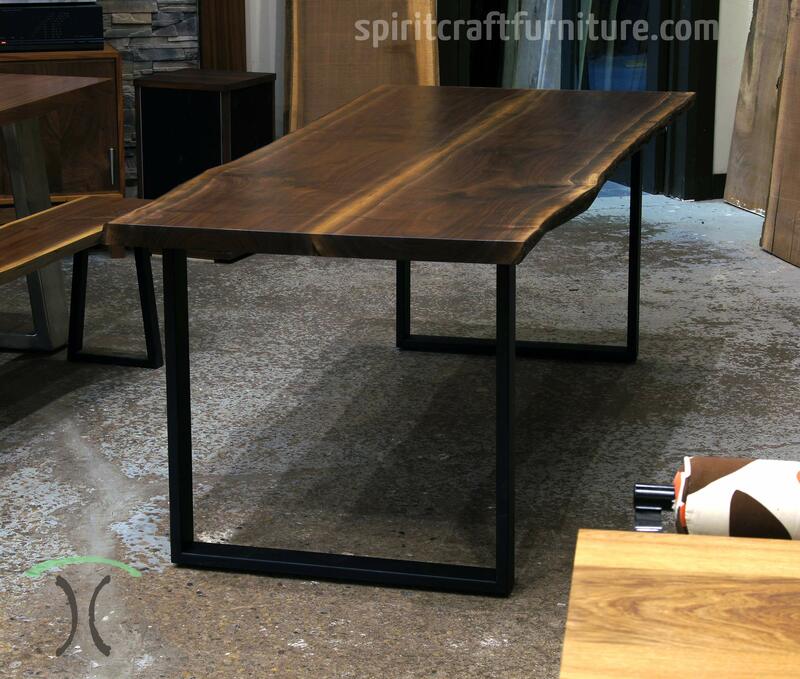 We are not the typical start-up company who is trying to build slab tables out of wet or partially dry wood with suspect construction methods and glue joints but rather crafts-persons and furniture designers who understand hardwoods and have a designers eye for detail. As a final word about glue joints: The use dowels and biscuits add nothing in terms of strength or durability to a glue joint, but rather only offer a false hope that a glue joint will not fail. 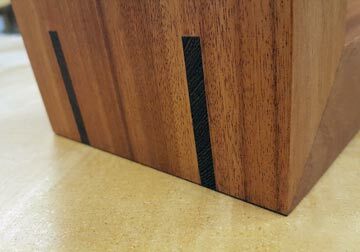 Conversely, a true, carefully crafted and perfectly square glue joint when joined with a time tested wood glue and clamped correctly is stronger than the wood itself and should be nearly invisible on the end grain. 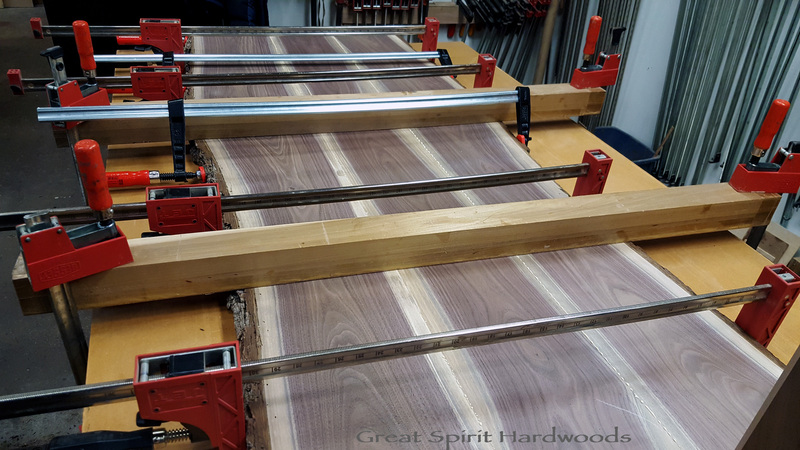 Our glue joints are marveled at by fellow woodworkers and if one is not absolutely perfect, we go back to the jointer to make it perfect so that it will still be admired 100 years from now. 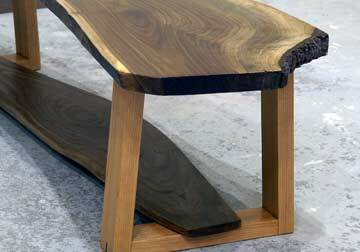 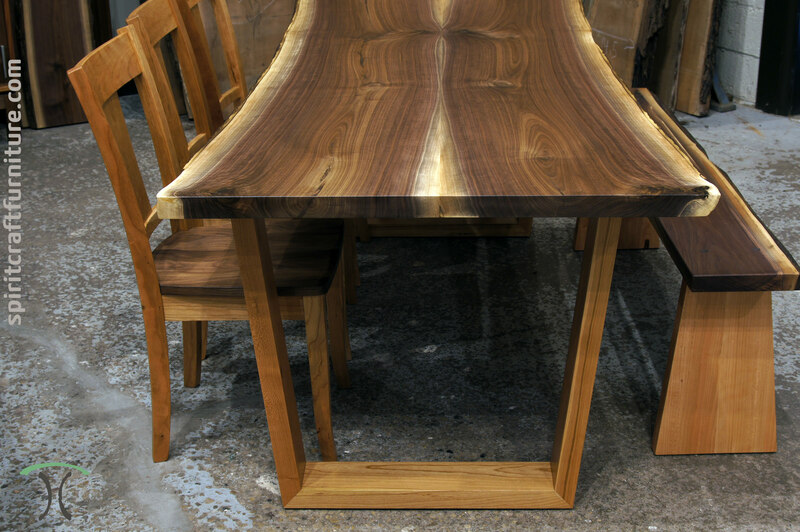 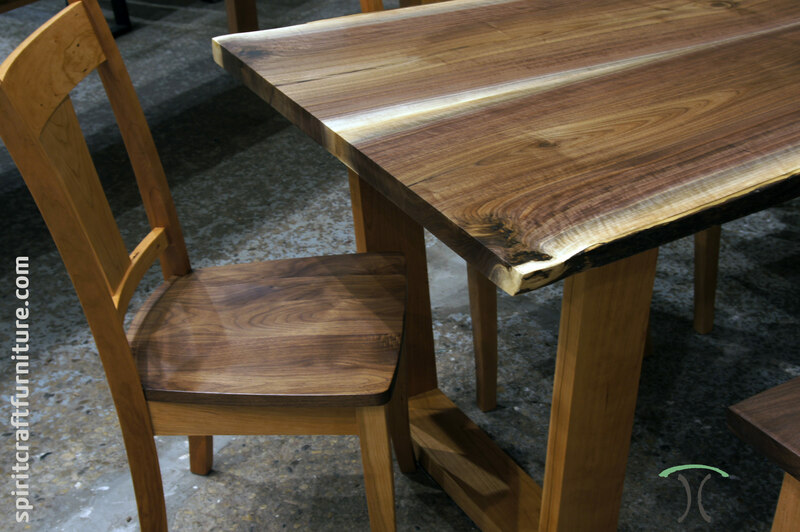 Tree Shaped Walnut Slab Table with "Wedge"
It is critical that the hardwood in live edge tables, furniture or table, island, counter and desk tops be carefully kiln dried. 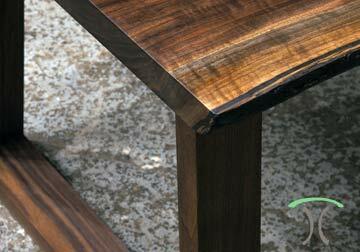 Beware of "air dried" hardwoods and slabs as they are certainly not uniformly dry and will deform as they dry in your environment. 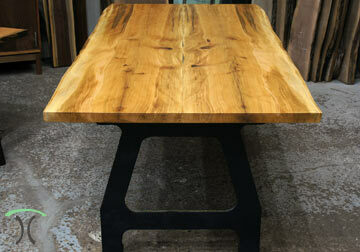 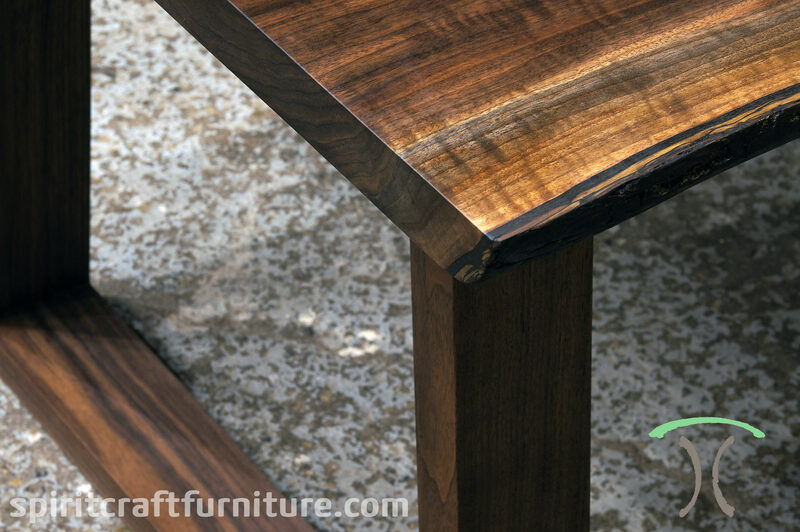 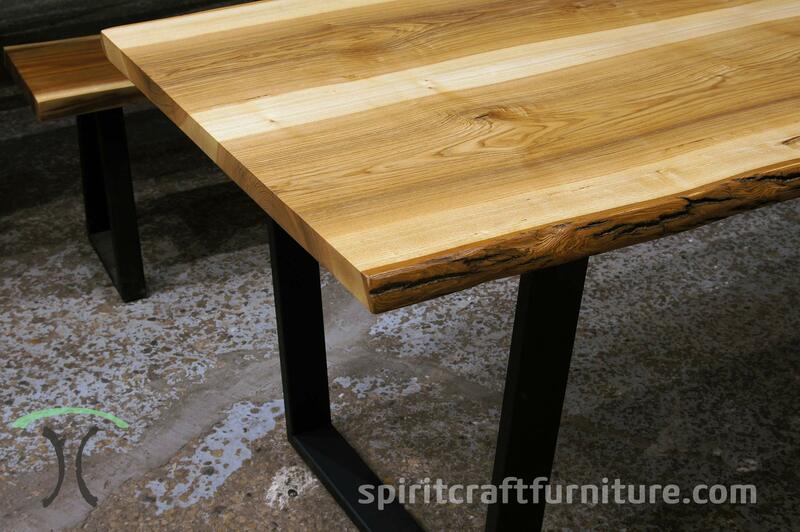 We use only the finest hardwoods and slabs for our furniture, table tops and live edge slab tables. 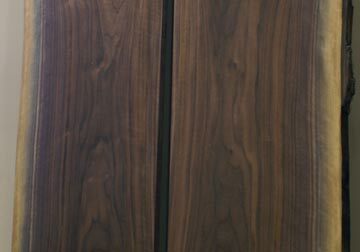 All of our hardwoods and slabs are kiln dried to 7% to ensure the enduring quality our customers demand. 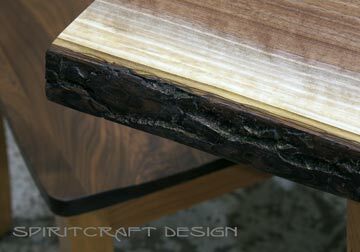 Proper drying is essential in furniture making and is even more critical when it comes to massive slab tables and live edge tops. 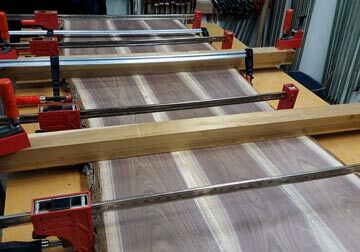 Do not accept anything other than properly kiln dried hardwoods as problems such as cracking, cupping, warping are not merely probable but are guaranteed if using "wet" wood. 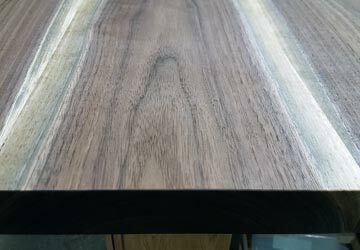 We consider anything over 9% wet and we are taking about the outer surface measurement though the center of a slab or board will be much higher in air dried hardwood. 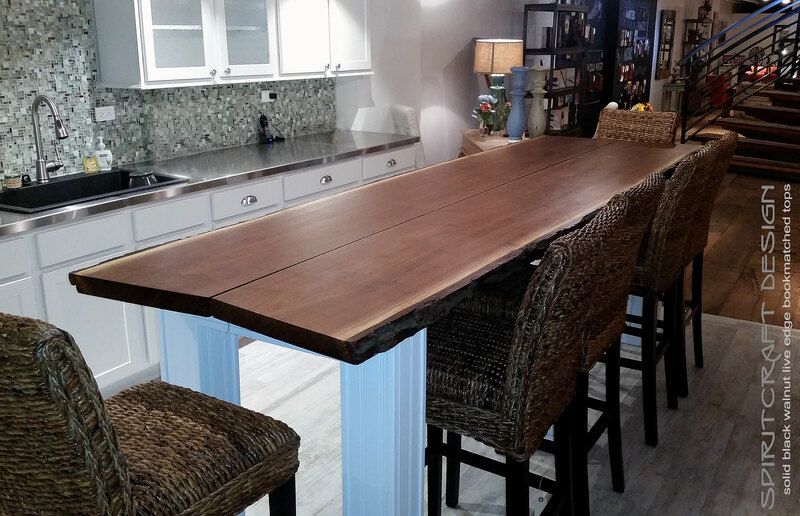 Thus, we do not use wet or semi dry, "air dried" hardwood as we insist that our clients are satisfied upon delivery and remain so in the years and decades to come. 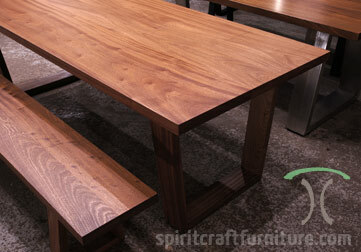 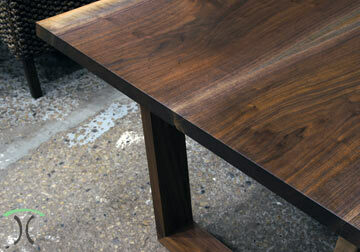 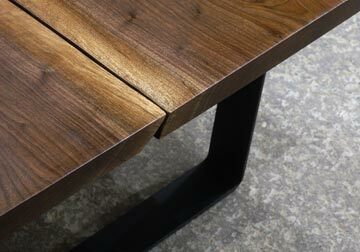 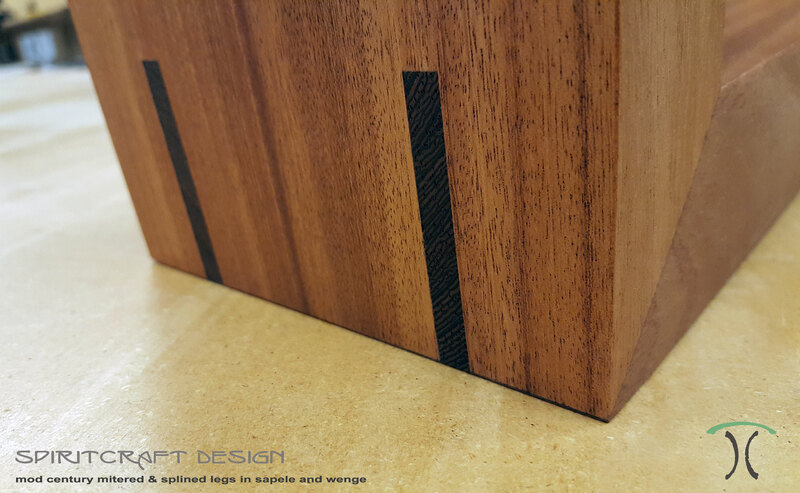 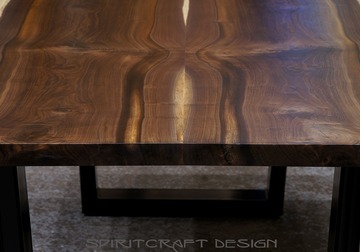 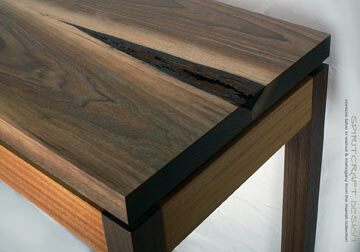 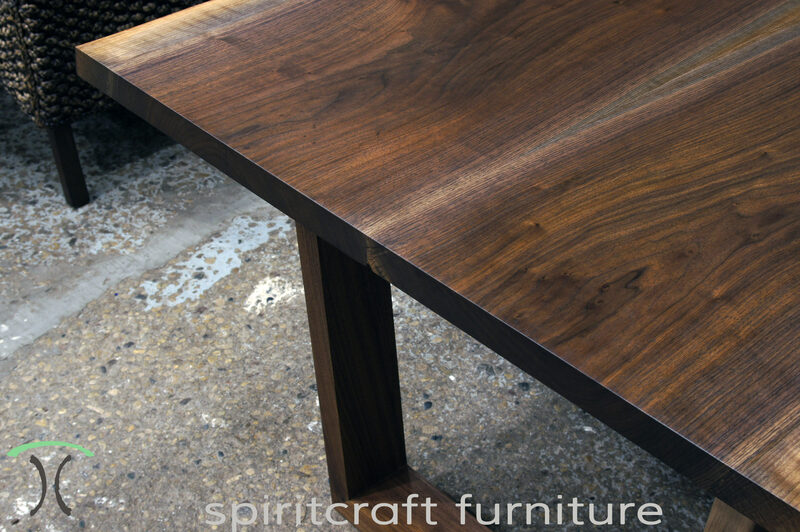 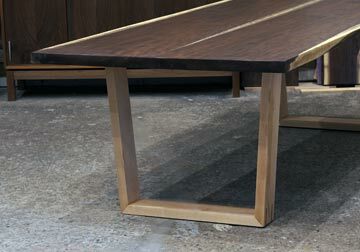 A substantial and critical aspect to furniture making and with large thick tops in particular is seasonal wood movement. 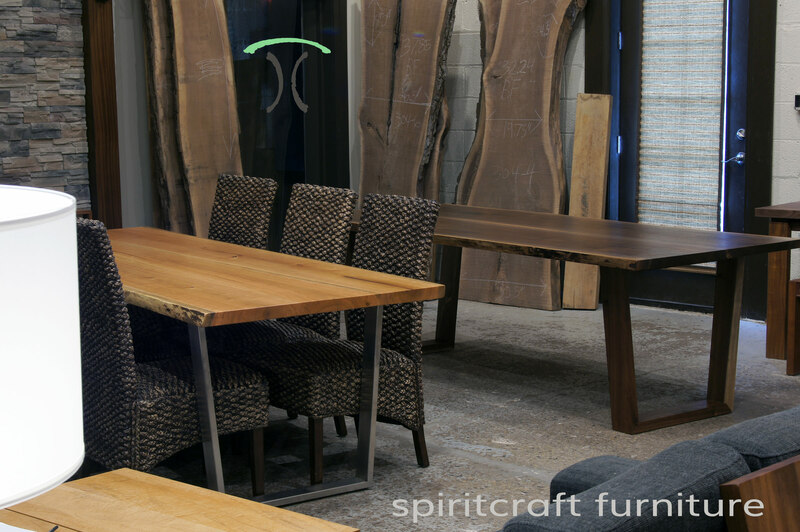 We are experts in planning for this unstoppable force of nature. 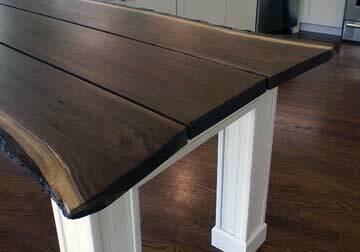 Hardwood remains a living thing within furniture and slab tops and must be respected and planned for. 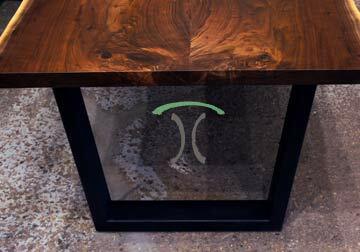 We pay attention to everything including the climate that we ship and install our furniture and hardwood tops into and offer only the finest kiln dried hardwoods in our furnishings and table top products. 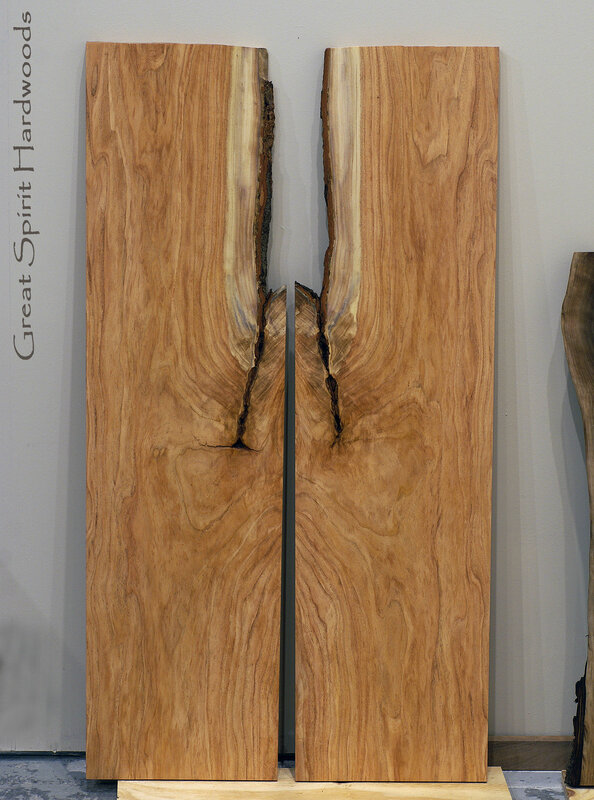 Live edge slabs as Decorative Artwork: Hardwood slabs as unique natural art can transform a living or working space and will enhance nearly any decor style. 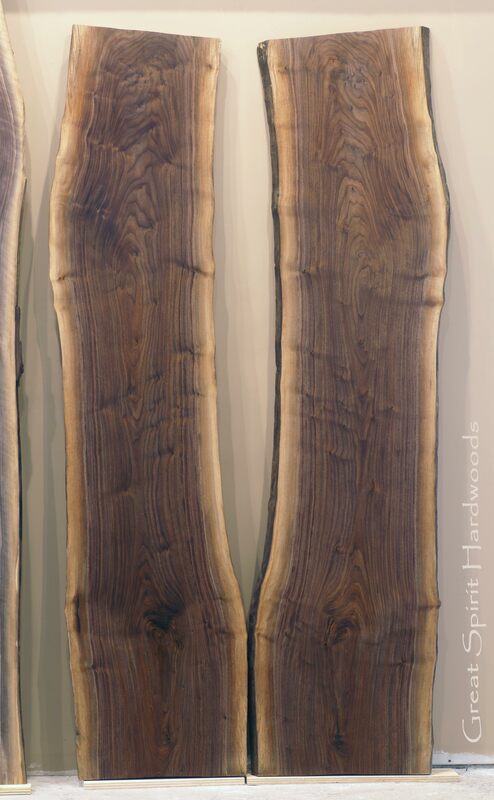 We have installed countless live edge and book matched hardwood slabs as visual masterpieces within homes, commercial environments and office spaces. 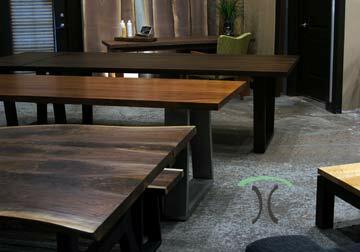 Our natural slab art has been very well received and a variety of species, sizes and shapes allow a client to find the perfect fit for any wall. 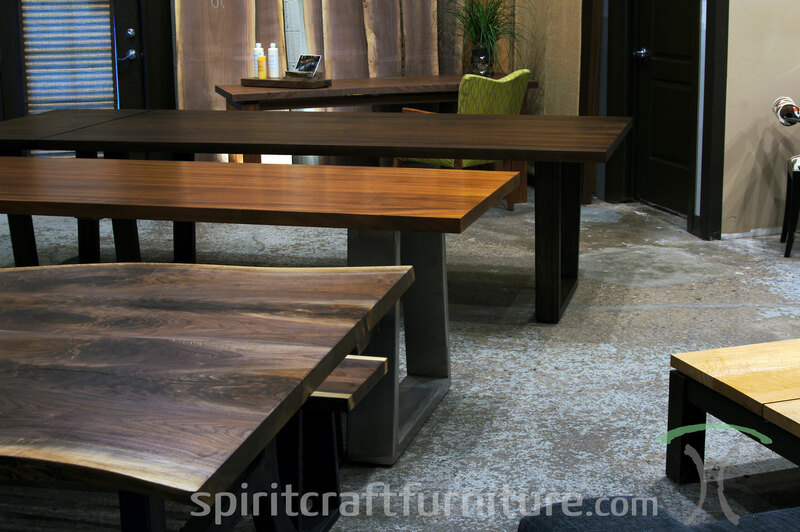 As with our retail hardwoods and furniture, our book matched slabs are kiln dried and selected for grain, visual interest and color. 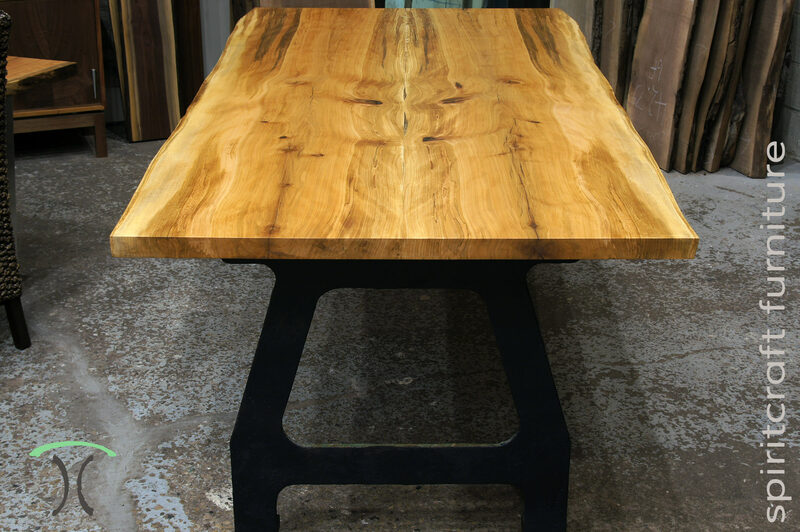 Visit our Chicago area live edge slab table retail store for dining, coffee or conference table or island counter or desktop in East Dundee, Illinois.